A Tip for Viewing this Page: If any of our content - especially videos - does not load correctly, please do a hard refresh of your broswer. Unsure how to do this? Click [HERE] for easy instructions. On the 77th anniversary of the attack on Pearl Harbor the family of Jack Cremean finally has closure. Cremean was a marine serving on the U.S.S. Oklahoma when the Japanese attacked Pearl Harbor on December 7, 1941. Donna Moren is a niece of Cremean. She never met her uncle, he died many years before she was born. "We knew of him. He wasn't a mystery. My mother and my aunt talked of him constantly. We had things that he had sent home from Hawaii. So we had memories," said Moren. Those memories include photos plus a grass hula skirt and sailor doll Cremean sent home before he died. Cremean was laid to rest Friday afternoon in Madera. His family wondered if he would ever have a finally resting place since Cremean's parents didn't know for months that their only son had been killed. "It was an emotional roller coaster for them because at first they got a telegram telling them he was missing in action. Then they got a telegram telling them no we were wrong he's on another ship," said Esther Spradlin, Cremean's Niece. He was declared dead the following March but his remains were never identified until of August of this year. Cremean's sister Ruth was contacted by officials in 2001 for a DNA sample to help identify remains in the graves of the unknown in Hawaii. But closure would come two years too late. "She hoped to live long enough to find him but she passed away in September of 2016. So we know they are together in Heaven and she knows where he is but his remains were really important to find and to give closure," said Moren. Cremean was laid to rest at the same cemetery where his parents are buried. He is survived by his three nieces, three nephews and their families. On December 1, 2018, Chaplain Brian Bohlman was in Normandy, France, for a special observance to honor the fallen from WWI. The Wreaths Across America organization filmed the observance and posted it on FaceBook. At 15:45 into the clip, Chaplain Bohlman offers the invocation. Morals are often unspoken, until they are violated. Scott James in “An Introduction to Evolutionary Ethics” proffers, “Part of what makes moral creatures moral, then, has to do with thinking that acting in ways that are forbidden deserves punishment while acting in ways that are (for example) selfless deserves praise.” This might explain why so many Veterans find themselves engulfed in shame whenever they encounter a Moral Injury. There are many who believe mankind is made up of body, mind and spirit. If this is true, it becomes easier to recognize a Moral Injury can be egregious to each part of their person. It can negatively impact the body, plague the mind and damage the spirit. Moral Injury will often find people expressing different types of negative expressions (fruits) in their lives. I would contend that if the root – or the actual offense/trauma – is not dealt with, then people will be plucking debilitating fruit for the rest of their lives. Relief comes by addressing the root cause. Please consider the following story as one example. For the purpose of this article, we will call her Amy. I first met Amy in our psych ward, and like many Veterans there, she was initially hesitant to meet with the Chaplain. All she wanted to do during her first day on the ward was to stay in her room and be left alone. I read in her chart where Amy came to the ward because of suicide ideation. She self -medicated with alcohol, which eventually led her to breaking the law. I soon learned her drinking was also hav- ing a negative impact on her faith practice. The following day, Amy agreed to meet for a short visit. Amy slowly began to reveal how she had been a victim of Military Sexual Trauma (MST) while serving in the armed forces. She not only endured the assault, but was impreg- nated by her assailant. Amy looked like an empty shell as she shared her story. Amy went on to say this was not the first time she had endured such a violation, but had been violated by a family member when she was a child. We started from there by recognizing first and foremost that forgiveness is not an emotion. Instead, it is an act of the will. Just as Amy’s God of the Bible chooses to love and forgive her, so those within her belief system must choose whom they will love and forgive. She sat quietly musing over what was said. Amy confided that she did not know how to forgive. I suggested that we look at some Scriptures for guidance. First, we turned to Proverbs 18:21, “Life and death are in the power of the tongue, and those who love it will eats its fruit”. Then, we turned to Luke 6:45, “The good person out of the store of goodness in his heart produces good, but an evil person out of the store of evil produces evil; for from the fulness of his heart, his mouth speaks.” We dis- cussed how each heart is a reservoir that contains our deepest thoughts and emotions; however, our tongue is the tool by which we communicate them to others. I shared with Amy the challenge with forgiveness is that we must choose as an act of our will to start speaking what we want to be in our heart; instead of what is already in there. Otherwise, we encounter a cyclical roller-coaster of emo- tions that prevents us from fully dealing with the trauma. I reiterated to Amy that a Moral Injury is shame based, and forgiveness is what breaks the shame; yet, forgiveness is an act of the will. Amy was encouraged to consider taking some time to think all of this over. I suggested she might use prayer to offer forgiveness. Amy asked if there might be an example of how to employ such a prayer. I offered the following: “Lord, I choose as an act of my will to forgive (name of perpetrator), for (speak to whatever they did that needs forgiving). Amy was encouraged to pray this prayer privately. She then asked if I might pray for her. When we finished, I looked up and her entire countenance had changed. What had previously sat before me was a woman who looked hopeless. Now she was beaming with a smile that went from ear to ear. It was one of the most transformational events I have ever witnessed. Later in the day, several the nurses on the ward asked what had happened with Amy, because they could not believe what they were seeing. On Friday morning at our team meeting, Amy’s Psychia- trist shared how her dramatic change might only be a short-lived spike. Nevertheless, everyone was thrilled to learn on Monday morning that Amy had not digressed over the weekend; rather, she had remained steadfast. Her Psychia- trist ended up discharging Amy later that day. Like so many other Veterans who are cloaked in shame with whom I have worked, forgiveness was the key for them being set free. Each V eteran’ s story is different; yet, the process has been the same. Some Veterans needed to forgive someone else, while others needed to forgive God. Many needed to forgive themselves or any combination of the three. My experience has shown me that truly, for- giveness is the most efficacious tool we can use when it comes to Moral Injury. Editor's Note: John Bailey is both an Air Guard Chaplain and a VA Chaplain under CSC endorsement. WI, UNITED STATES — Army Cpt. 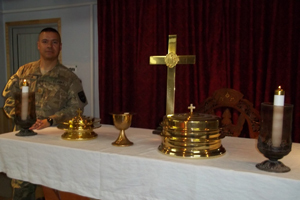 Dawn Quiocho, Batallion Chaplain with the 90th Chaplain Detachment from Schenectady, NY, held religious services for Soldiers at the Combined Support Training Exercise on Fort McCoy, WI, on August 12. The role of a chaplain is to provide moral and spiritual support to Soldiers, and help them cope with the challenges faced during training. Naval Medical Center, Portsmouth, VA — Naval Medical Center Portsmouth, in conjunction with Hampton Veterans Affairs Medical Center (HVAMC), held a graduation ceremony for the nine members of the 2018 class of the Pastoral Care Residency Program, Sep. 28. Cmdr. Chris Hester receives his Clinical Pastoral Education (CPE) residency certificate. Capt. Christopher Culp, NMCP’s commanding officer, and Kim Nielsen, the clinical pastoral education supervisor, presented the certificate during a graduation ceremony on Sept. 28. 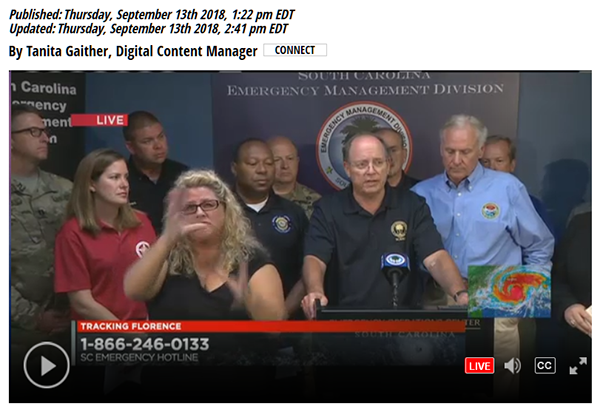 Army Guard Chaplain John Denny on TV with Governor Henry McMaster of SC during Florence. He was representing the National Guard and its response to guidance from the Governor. Photos of Chaplain John Bailey keeping busy during his deployment to Southwest Asia appear in this edition of The Chaplaincy Connection newsletter of the Air National Guard Chaplains Corps. See page 7. 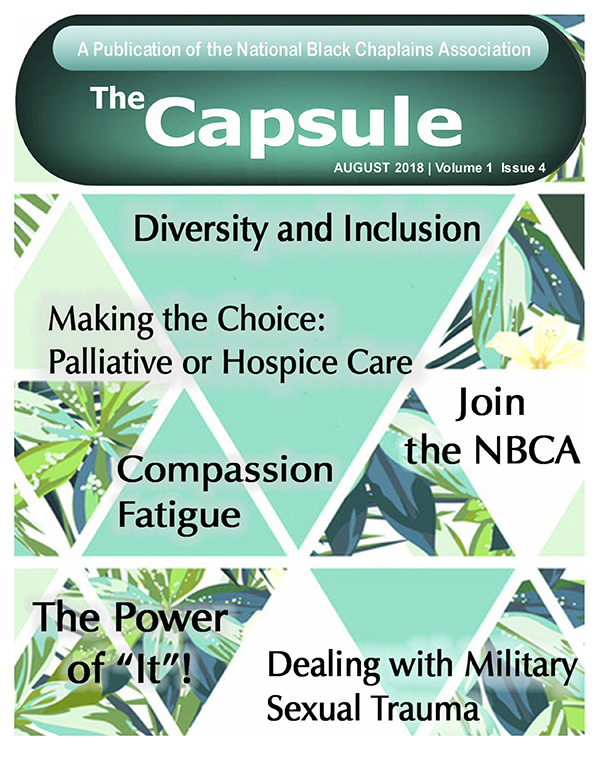 In this edition of The Capsule of the VA National Black Chaplains Association, 4 CSC chaplains have columns: Alfray Thomas, Jeffery Stallworth, LaToya Smith, and Barry Williams. featured in the new Army Chaplains recruiting literature. Chaplain Major Sharon Browne, D.Min. Browne’s spiritual formation happened while stationed in Germany. As a divorcee, she says her Christian story wasn’t perfect; however, it made her relatable to fellow Soldiers. Although Browne wasn’t aware of the chaplain corps at the time — let alone in pursuit of it — people often sought her out for chaplain-type conversations. “All that time, God was grooming me,” she says. 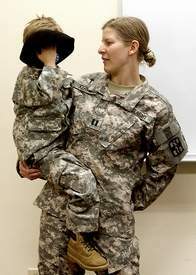 When Browne left active duty, she returned to New York, enlisted in the Army Reserves, and set about putting her life back together after the divorce. Unpaid, she taught youth classes and Sunday school in a Pentecostal church. She led revivals and supported funerals and weddings. But, September 11, 2001 was a turning point in Browne’s faith journey: on that day, she found herself standing at Ground Zero. “I watched people jump out of the buildings because their options were to either burn or die that way,” she recalls. Among the chaos, she thought: How many of those people are dying without doing what God told them to do? “I didn’t want that to be my story,” she recalls. Soon after, Browne enrolled in seminary. It wasn’t long before the dean of the seminary asked a crucial question: Where do you belong? “I realized that the only people I knew how to talk to were Army people,” she says. So, on her 41st birthday, Browne reenlisted. She was deployed right away. During that time, chaplains helped her plot her own path to the chaplaincy. Now, 10 years later, Browne is a Major and recently earned her D.Min. 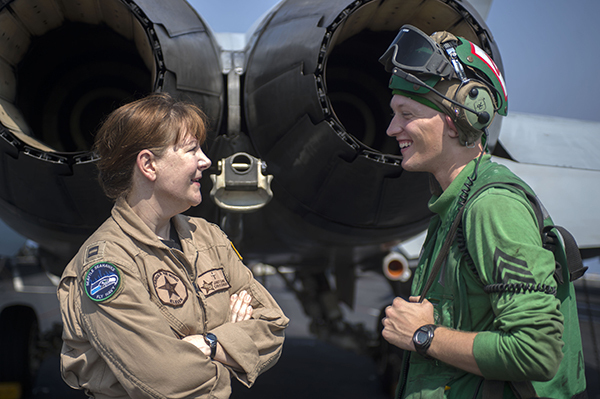 She is one of 65 female chaplains on active duty — just 4.3% of the chaplain corps. For many Soldiers Browne meets, she is the first female chaplain they’ve ever met. For Browne, the most rewarding aspect of Army chaplaincy is walking with Soldiers in varying stages of their lives — the highs and the lows. She has married Soldiers in her unit and baptized and dedicated their children. She has also of ciated funerals and comforted Soldiers in battle. When a young man was killed on patrol and his body was brought back to camp, the young Soldier who had tried to revive his friend was in desperate need of comfort. Joyful or tragic, Browne says she is grateful for any opportunity to minister to Soldiers. While the rewards are many, Browne also strives to be transparent about what’s required of an Army chaplain applicant. First and foremost, one’s spiritual discipline needs to be secure. Naturally, active-duty, full-time chaplaincy isn’t right for everyone. For some — full-time church leaders, in particular — Browne suggests that Army Reserve chaplaincy can offer a better fit. From a practical standpoint, it makes good nancial sense. Browne cites a recent Pew Research study showing the average age of clergy in the pulpit is 55. Pastors aren’t retiring — not because they don't want to, but because they can't. “I believe that one of the things that we can do as wise stewards of the resources that God gives us — including our time and our young, strong bodies — is to create multiple streams of income,” she says. 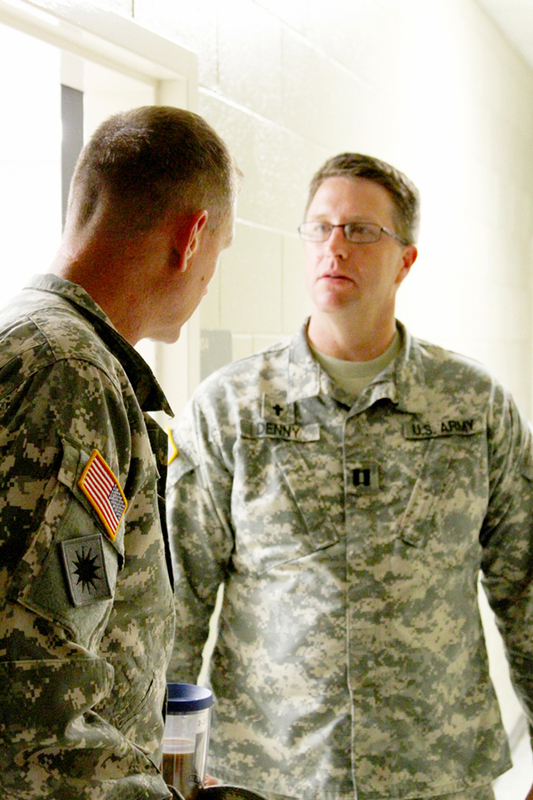 Additionally, Army Reserve chaplaincy builds experience. “If you’re viewing your worship space as ‘church,’ it becomes important for you to gure out how to stay relevant in whatever context you’re in,” she advises. CSC Chaplain Earns "Servant Leadership Award"
Editor's Note: Chaplain Candidate 2LT Geoffrey Walker is a CSC endorsee. 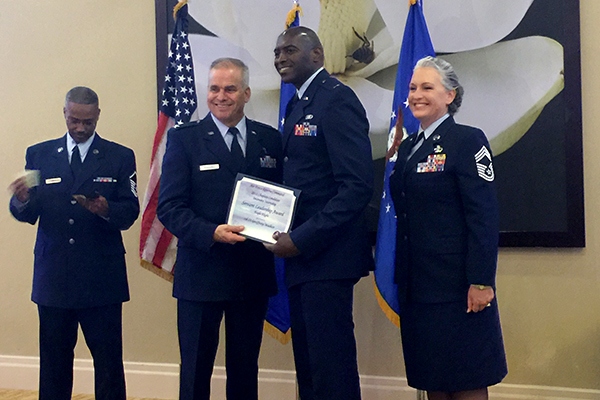 At the 2018 Air Force Reserve Command's Intensive Internship, Chaplain Candidate 2LT Geoffrey Walker earned the prestigious "Servant Leadership Award," presented at the Warner Robins graduation banquet on 27 July. Editor's Note: Chaplain (Lt.) Jereme Samson is a CSC chaplain. Thank you to everyone who made our Special Olympics track and field event a great success and fun for the athletes and volunteers. More than 200 athletes participated from schools in Beaufort and Jasper counties. The event was held April 26 at Hilton Head Island High School Stadium. Thanks to the many volunteers: St. Gregory the Great Knights of Columbus, Sun City Lions Club, Hampton Hall Community Foundation, Hilton Head and Bluffton high school JROTC and teacher cadets and the Bluffton Township Fire District. A very special thank you to Lt. Chaplain Janet Clarke and her Marine volunteers from Marine Corps Recruit Depot Parris Island who organized the event. We appreciate the many other individuals who also volunteered their time. Thanks also to the businesses and organizations that provided funding, goods and services: Palmaccio Management/McDonald's, Tom Cramer's Home Services, Kinghorn Insurance/Hub International, The Bargain Box, St. Francis Thrift Shop and Children's Relief Fund. We all have heard about the opioid crisis in America, and we as Chaplains wish to help all people who are in need in our facilities. The 2 groups of individuals affected by this crisis are the legitimate opioid users who have become accustomed to having their chronic pain treated by opioid medications; and the abusers who may have taken the medication legitimately in the past but are now abusing it. Both of these types of patients are impacted by the mandatory reduction in opioid prescribing, and hence, need care. What can we as Chaplains do to assist these patients? For our users, the first obvious intervention is prayer that the patient may be healed of the infirmity that is causing them pain. God is still in the healing business today! When the healing does not come immediately, we can recommend healing music (i.e. healing music search on YouTube), scripture reading as distraction therapy, and Yoga and Tai Chi. I believe we chaplains would be the ideal instructors for the Tai Chi so as to keep the spiritual element in line with patients’ belief systems. The Christian Bible (Matthew 4:18) addresses the Holy Spirit (Pneuma) as the source of healing for the brokenhearted; deliverance of captives (to opioid addictions); recovering of (spiritual) sight for the blind; and liberty for the bruised (of body, soul, and spirit). Deep breathing exercises (focusing on our breathing and the Holy Spirit/Breath) bring calmness from anxiety, which may reduce the severity of pain. Meditation is another spiritual exercise with which we can assist. King David, who was no stranger to pain, meditated on God’s Law day and night (Psalm 1:2). Isaac (Gen 24:63), Joshua (1:8), and Paul (1 Timothy 4:15) speak of meditation and recommend it as a normal spiritual discipline. For our abusers, we can provide prayer for deliverance from this disease. We offer empathic listening as they share the traumatic experiences of their past that may have contributed to them abusing substances to escape their emotional pain. We can provide spiritual counseling from their faith tradition, and assist them in dealing with their moral injuries. We can assist them in giving and receiving forgiveness for God, for others, and for themselves; as well as dealing with any grief and loss that they may be experiencing. We can offer Celebrate Recovery Groups or assist local churches with providing them. In our weekly Grief and Loss class here at the Martinsburg VAMC we discuss grieving the death of the parts of ourselves that we lost in combat/MST. For instance, just before Desert Storm, I helped my brother-in-law move a wall inside his house. We ran into several set-backs as we worked, and he commented that it seemed I never got upset about anything. After combat, it seemed that everything was able to set me off. That patient part of myself was another victim of the war, and I miss it. I had to grieve that loss within myself, as well as the loss of my innocence, and belief that I was invincible. I then had to learn how to be patient when it no longer came naturally. God uses our own struggles and victories to form and inform us so we may assist others in struggles and temptations. When I was a little girl, I could remember my mother and my aunt, who were regular church goers, say, “Alright ya’ll it’s time to go Easter shopping”. I would always get so excited, because that meant to me, the beautiful colorful dresses, with the over kill of ruffles at the bottom of it. The ruffles were so big, to the point, I couldn’t even see my pretty shiny black or white strapped shoes, or my white ruffled socks. Oh yeah, I can’t forget the white gloves, one millions barrettes in my hair, and to top it off, the great big Easter basket, that was bigger than me. I can remember my mother buying us dye and dying what seemed like hundreds of eggs and then hiding them all over the place at church or at home, which we would spend so much time looking for them. They soon found out that eating too many boiled eggs wasn’t a good idea, so they changed to the plastic eggs with candy inside. That was Easter to me then. At church, I can recall all of the women wearing white, and the men wearing white or black suits depending on their position in the church. The preacher would wear his big shoulder padded, white beautiful robe. I remember walking in the doors and hearing, “aww... look at her, she look so cute with her pretty dress on”. I was shy, but I loved the compliments. After the preaching, and please don’t ask me what the preacher said, there would be an Easter play and then we would go Easter egg hunting. I never understood where the rabbit or eggs came into the picture, but it was fun. Even though I never understood the sermons, I never heard them mention anything about eggs or rabbits in the preaching. That was Easter to me then. Let me tell you what Easter means to me NOW..... (I might preach). Romans 5:6 For when we were yet without strength, in due time Christ died for the ungodly. I believe Easter represents true freedom and true holiness (Eph. 4:24 KJV) for those who wholeheartedly believe in Jesus’ death, burial, resurrection, ascension, and that He’s coming back! Hey glory....I just got happy. When Jesus was resurrected from the dead, it was not just a symbol of deliverance from sin, but for those who truly believe, it is deliverance from the power of sin. It also is freedom from the penalty of sin, which is death (eternal damnation for the soul and the spirit) (Rom 6:23 KJV). If the Son (Jesus) therefore shall make you free, ye shall be free indeed (St. John 8:36, KJV). His birth was the beginning of freedom from eternal damnation. Jesus ‘life, even though he was not born in sin, represented how mankind should live before God (free from sin), though many think this is impossible. (For he hath made him to be sin for us, who knew no sin; that we might be made the righteousness of God in him 2 Cor. 5:21). Jesus’ death represents what man should do daily (1 Cor. 15:3); stay connected spiritually to a spiritual God (St. John 4:24 KJV). Jesus’ birth, life, and death, which for mankind means you must be born again (St John 3:7), positions our life to be set apart from the world, dying daily to sin (1Cor. 15:31), and walking daily in newness of life (Romans 6:4 KJV). The resurrection of Jesus Christ from the dead or Easter Sunday, is the gift that God gave because He loves us, His creation. I live for God through Jesus Christ because Jesus is the atonement for my sins. His death means that He died to the very thing that was keeping me from God and eternal life. Easter Sunday to me now, is no longer about the little girl in the pretty, colorful, extremely ruffled dress, but the woman of God who believes in the full gospel of Jesus Christ and the power of His resurrection and what it did for me when I believed on it by faith. And when He had given thanks, He brake it, and said, take eat: this is my body which is broken for YOU: do this in remembrance of Me. After the same manner also He took the cup, when he had supped, saying, this cup is the new testament in my blood: this do ye, as often as ye drink it, in remembrance of Me. For as often as ye eat this bread, and drink this cup, ye do shew the Lord’s death till He comes. Editor's Note: Chaplain Olga Westfall is a CSC chaplain with both the VA Medical Center in Atlanta and with the Air Force Reserve. To view and download the April 2018 Straight Talk newsletter, click on the image above. This article can be found on page 10 of the publication. 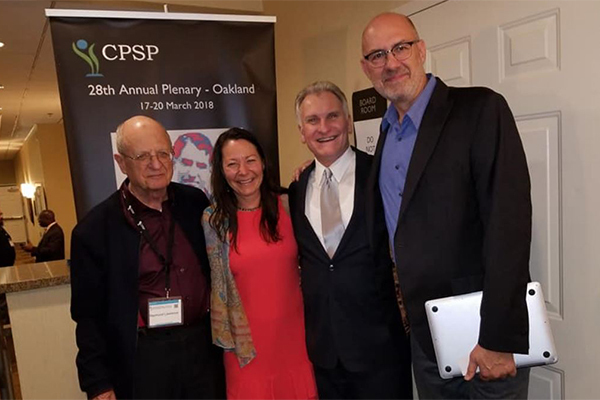 From left to right: Dr. Raymond Lawrence, General Secretary; Ruth Zollinger and David Plummer, Co-Presidents; Dr. David Roth, 28th CPSP Plenary Host. 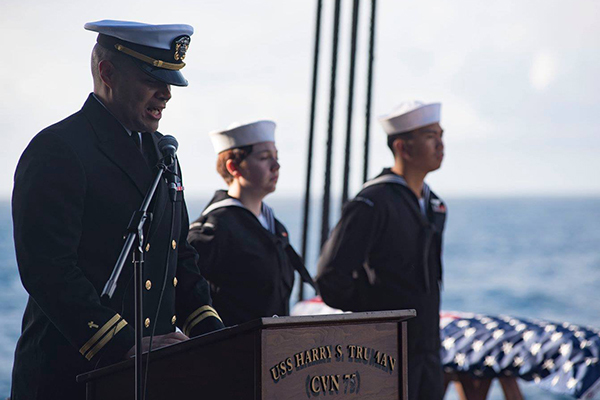 When Sailors join the service they raise their hand and swear to serve a higher purpose, but for three Sailors who got underway aboard USS John C. Stennis (CVN 74) Nov. 3, it was to serve a higher calling. Lt. Sarah Gomez-Lorraine, Lt. j.g. Jerry Roberts and Lt. j.g. Frank Tillotson are inactive reserve Sailors enrolled in chaplain candidate school. The chaplain candidates, each with different religious backgrounds and prior enlisted service in the Marine Corps, Army and Navy, came together on the underway to gain on-the-job experience and use the skills they learned during the first part of their chaplain candidate schooling. Each candidate has his or her own reason for becoming a chaplain. For Roberts, from Dyersburg, Tennessee, it seemed destined. Tillotson was inspired to become a chaplain after seeing the struggles other service members have dealt with after coming home from combat. After years of schooling and preparing, the candidates were enthusiastic to put their skills to work. Lt. j.g. David Albano, a commissioned chaplain stationed aboard John C. Stennis who recently completed the same program, said he was excited to share the experience with the chaplain candidates. From showing them around the ship and meeting Sailors to leading services, Albano said this has been a great experience for everyone. He also added how grateful he was to the crew for welcoming the candidates and making them feel at home. The road to becoming a Navy chaplain can be long and difficult. Requirements differ depending on the religion and denomination, but the common standard for entering the chaplain candidate program is having a master’s degree in divinity, which can take anywhere from two to five years. After that most chaplains complete at least two years of postgraduate full-time ministerial experience, before being eligible to apply for active duty. After the candidates finish the underway aboard John C. Stennis, they will return home where they will continue on the path toward becoming a Navy chaplain. The Rhode Island National Guard observes Clergy Day. 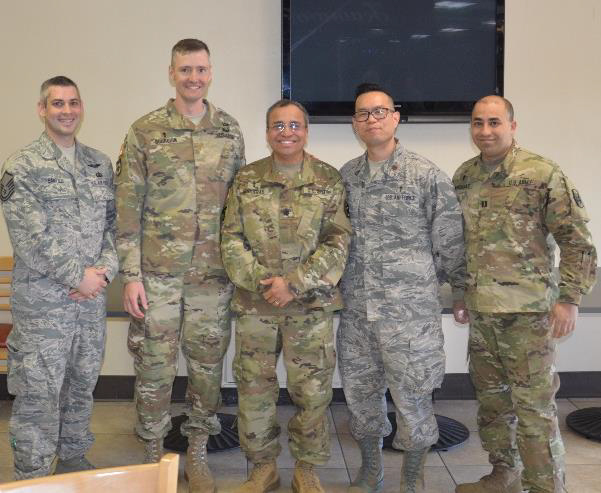 Chaplain (LTC) Eliseo Nogeras, Sr. and Chaplain (CPT) Eliseo Nogueras, Jr shown in the picture are Coalition of Spirit-filled Churches chaplains. At the event, held April 19, 2017 local clergy were greeted by the RI TAG, BG Callahan and the 143rd Airlift Wing CDR, Col Dan Walters. Additionally, they heard from a Service Member, MSgt Paul Santilli who shared his journey through the Guard and from Senior Army Chaplain, CH Nogueras as he recounted his call to the Army Chaplaincy. Recruiters also educated the clergy members on opportunities in the Guard for their congregants as well as opportunities within the Chaplain Corps. Other topics included Moral Injury and Community Partnerships and DSCA. 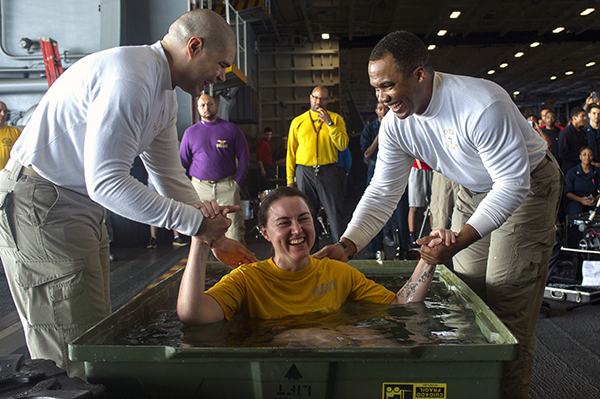 CSC Chaplain experiences a "baptism of fire" on "The Ice"
MCENTIRE JOINT NATIONAL GUARD BASE, S.C. — Have you been to The Ice? For one Swamp Fox, South Carolina Air National Guard Chaplain (Lt.Col.) Brian Bohlman, the answer is yes. The Ice is the nickname for Antarctica for those scientists and personnel who live and work there. Bohlman is currently serving on a 60 day tour at McMurdo Station as part of an ongoing Air National Guard (ANG) Chaplain rotation known as Operation DEEP FREEZE. He is scheduled to come home early in December. Bohlman is the senior Chaplain for the 169th Fighter Wing at McEntire Joint National Guard Base in Eastover, South Carolina. It is believed that when Bohlman set foot on Antarctica in early October, Swamp Foxes from McEntire have now deployed to all seven continents. His deployment was months in the making. Every year the director of the ANG Chaplain Corps sends out an email to all ANG Chaplains looking for volunteers to serve a rotation for Operation DEEP FREEZE. Applicants are competitively selected and have to meet an exhaustive list of training requirements and experience including spiritual resiliency, crisis and traumatic response, mass causality and emergency response and so on. The Chaplains who serve at McMurdo Station work with a very diverse transient population consisting of both military and civilian personnel. Bohlman volunteered for this mission earlier this year and was selected for the opening rotation. So how does one get from South Carolina all the way down to Antarctica? The answer is: not very easily. It's only a mere 8,840 miles. "I flew commercial all the way to Christchurch, New Zealand which took me close to 36 hours due to several long layovers awaiting connecting flights. Then I took a New Zealand 757 military aircraft which landed on the Ross Ice Shelf runway at Williams Field, McMurdo Station. Landing on the ice didn't feel too much different from asphalt and I was able to record the landing with my video camera," Bohlman said. The U.S. Antarctic presence is led by the National Science Foundation under the auspices of the U.S. Antarctic Program which conducts scientific research in that region. Work is performed at three bases: the South Pole (Amundsen-Scott Station), Palmer Station and McMurdo Station, which is approximately 850 miles north of the pole. "Research is performed at and near McMurdo Station in aeronomy and astrophysics, organisms and ecosystems, earth sciences, glaciology and glacial geology, integrated system science, ocean and atmospheric sciences. Participants in the Antarctic Artists and Writers Program also work at sites in the area," Bohlman said. 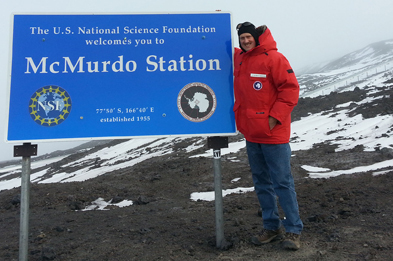 Approximately 950 personnel work as McMurdo and about 100 of those are ANG members. The 109th Airlift Wing from the New York Air National Guard provides airlift support for the National Science Foundation. And Operation DEEP FREEZE, as currently constituted as opposed to historically, provides the critical military logistical support for the National Science Foundation but is not a free-standing military mission. To say that the working conditions in Antarctica are austere and remote would be a bit of an understatement. Antarctica has a well known reputation for being the coldest, windiest, and amazingly, driest (approximately two inches of precipitation per year) continent on the planet. Nearly all of the landmass is covered by ice. Bohlman noted that the average annual temperature at McMurdo is zero degrees Fahrenheit with highs reaching 46 degrees Fahrenheit in the summer and minus 58 degrees Fahrenheit in the winter. Being that the seasons are opposite in the southern hemisphere, it is their spring season right now. "The highest temperature I've seen since I've been here is about 30 degrees. The lowest was minus five with a wind chill minus 20 degrees. We had snow about a week ago but it eventually melted due to the 24 hours of daylight that will last until the week of February 20, 2017," Bohlman said. Bohlman is a part of the McMurdo Ministry Team and works at the Chapel of the Snows, the southern-most place of worship in the world, as it is locally known. Chaplains conduct worship services, provide counseling, spiritual guidance and are on call at all times. As with most deployments, the days do seem to run together. "It does feel a lot like 'groundhog day' since there's a lot of repetitions of eat, work, sleep, repeat cycles. However, taking time to hike one of the many trails or going on a recreation trip helps clear one's mind and breaks up the monotony of the daily grind," he said. Working in such a harsh environment like Antarctica does entail some risk as Bohlman found out on only the second day of his deployment. A scientist conducting field research accidently fell into a crevasse and was killed. It was quite a shock to the McMurdo community. "Within 48 hours of my arrival, I was called to the [Emergency Operations Center] and activated to provide crisis pastoral care and counseling to 40 persons involved with the tragic loss of beloved glaciologist involved in a snow mobile accident. In many ways, this was a 'baptism of fire' for me and underscored the value of having a chaplain available to provide emotional and spiritual care in times of crisis. The memorial gathering provided many with a forum to celebrate his life and his many accomplishments and resulted in a closer, resilient community," Bohlman said. For reference, McMurdo Station is now 18 hours ahead of Eastern Standard Time. Bohlman said the time difference makes it a challenge to talk to his family back home. So he usually corresponds via email. He lives in a dorm with other U.S. personnel and has a room to himself due to the nature of his job requiring confidential counseling. With the approach of total daylight during the Antarctic summer, Bohlman said it took some getting used to. "I had to take tin foil to darken my room because I was having trouble sleeping at night. I really miss seeing it get dark and watching a good sunset. The 24 hours of daylight makes it hard to know when to stop working," he said. In a place like Antarctica, all the food is obviously imported but surprisingly good according to Bohlman. "We have C-17s flying in 'freshies', fruits and vegetables, from Christchurch. The Galley, a/k/a the dining hall, offers many varieties to include vegan and vegetarian options. And there is pizza available 24/7 and that is very popular with those in a hurry to eat," Bohlman said. Even though he is on a military deployment, Bohlman says he only wears his Air Force uniform once a week. The rest of the time he blends in with the civilian personnel he ministers to. "I only wear my uniform on Mondays when I attend the meetings with the military staff. All other days I wear a dark blue rugby shirt with the National Science Foundation logo and the word Chaplain embroidered on it. Wearing jeans and this Chaplain shirt really helps me identity with the civilians here and there are two different cultures between the two groups. I also grew a mustache in order to blend in more with the civilian population. Strangely, it did make a difference upon my arrival and making first impressions with the civilians as many of them have long hair and beards." One interesting program Bohlman instituted while he's been at McMurdo is a discussion group studying the British polar explorer Ernest Shackleton. "On Thursday evenings a group of about 15 people gather at the Chapel of the Snows to watch film clips from the dramatized A&E movie Shackleton followed by a discussion about leadership, resilience, and faith. The other Chaplains who follow on after me will continue to lead the study group until the end of February. This group has been what I will miss most about this tour of duty, as people who I first met in Christchurch are still part of this study group, and I've made enduring friendships that will last a lifetime," Bohlman said. Reflecting back as his wraps up his tour to The Ice, Bohlman said he was glad he had a chance to participate in this unique mission. "There are several things that I've learned while I've been here and worked among a very diverse civilian population. A spirit of adventure is what first attracts people to apply for contract work in Antarctica. However, it's the spirit found within this caring community that brings people back here year after year. In fact, many people I met have been coming here to work for five or more years, and one person for over 30 years! I will also miss the community that I found here. All in all, I have no doubt that God sent me on a spiritual mission to this remote location for such a time as this to provide a ministry of presence, care, and hope at the southernmost place of worship in the world. One scripture that has been very meaningful to me is from Psalm 61:1-2 which says 'Hear my cry, O God; listen to my prayer. From the ends of the earth I call to you, I call as my heart grows faint; lead me to the rock that is higher than I.'" Francisco Muñoz is a 2016 Saybrook PhD graduate. His dissertation research was on: MIND-BODY MEDICINE EPIGENETIC TECHNIQUE’S (MET) POTENTIAL TO MODULATE ARC AND EGR1 (ZIF-268) GENE EXPRESSION IN BREAST CANCER PATIENTS. Dr. Muñoz has been selected for a NIH/NCI post-doc in research! He will be working with Dr. Linda Larkey, Professor and Mayo Clinic Research Affiliate, College of Nursing and Health Innovation at Arizona State University. Her research project is entitled, "Effects of Meditative Movement (Qigong/Tai Chi Easy) On Fatigued Breast Cancer Survivors." "There is something special about nursing because you're an educator no matter what you do," Leggett-Frazier said. "You're a detective to help them figure out where they are having problems and help them get over those problems, and you're a cheerleader because you are to motivate patients to help them do their very best in the areas they want to work on. It doesn't matter whether it’s diabetes, cancer or hypertension or any area of healthcare. It’s always the same." VA Chaplin W.R. Allen holds hands with a nurse as he recites a prayer during the Blessing of the Hands ceremony Tuesday. "It gives you the vibrancy to go back out and continue," Allen said. "It means a lot for us to be recognized with all the hard work that we do," she said. "I think some of the most important people are the veterans, the people who serve us everyday. We are very lucky for the population we serve. They've done a lot for us, and I like to give back to them." "We’ve just been called to this one," she said. Chaplain (Capt.) Quanika Bynum is a CSC Chaplain with the 42nd Air Base Wing/HC, Maxwell AFB, AL. ROBINS AIR FORCE BASE, GA — Air Force Reserve Command has announced the 2015 Air Force Reserve Chaplain Corps awards. 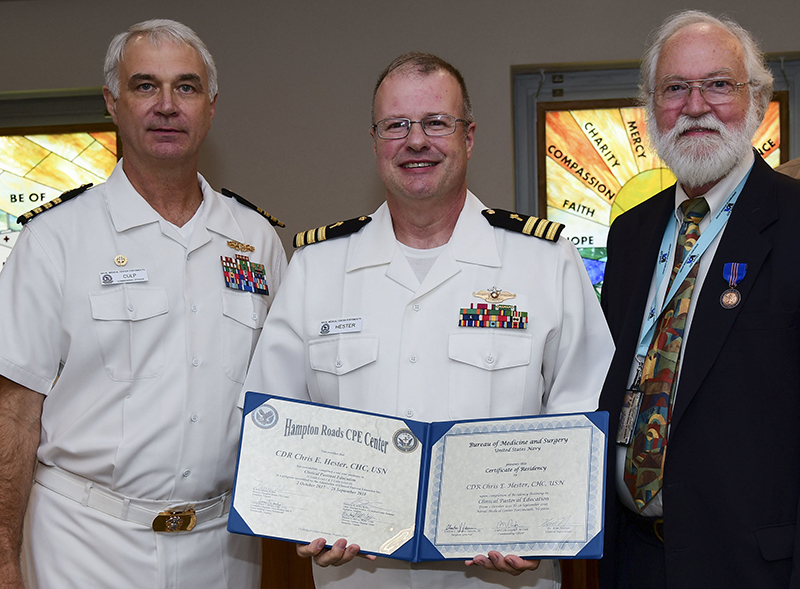 Thoralf T. Thielen Award for the Outstanding Reserve Chaplain of the Year, Chaplain (Capt.) 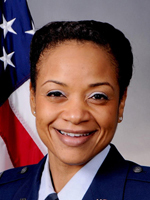 Quanika Bynum, 42nd Air Base Wing/HC, Maxwell Air Force Base, Alabama. 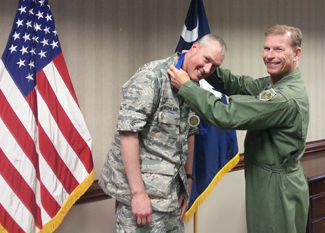 Citizen Airman Award for the Outstanding Reserve Chaplain Assistant of the Year, Chaplain Assistant Tech Sgt. Ralph Lopez, 502nd ABW/HC, Joint Base San Antonio-Lackland, Texas. Category A/Traditional Reservist, Chaplain (Capt.) Matthew Elps, 349th Air Mobipty Wing/HC, Travis, AFB, Capfornia. Category B/Individual Mobipzation Augmentee, Chaplain (Capt.) Matthew Spencer, 325th Fighter Wing/HC, Tyndall AFB, Florida. Category A/TR, Tech Sgt. Sergeant Elpott Denney, 944th FW/HC, Luke AFB, Arizona. Category B/IMA, Master Sgt. Andy Koundourakis, 20th FW/HC, Shaw AFB, South Caropna. AFRC Outstanding Chaplain Corps Program Award, 459th Air Refuepng Wing/HC, Joint Base Andrews, Maryland. AFRC Chaplain Ministry of Presence Award, 507th Air Refuepng Wing/HC, Tinker AFB, Oklahoma. AFRC Chaplain Corps Readiness Award, 920th Rescue Wing, Patrick AFB, Florida. 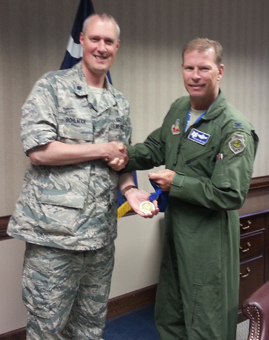 BOGOTA, COLOMBIA — South Carolina Air National Guard Chaplain, Lt. Col. Brian Bohlman and Master Sgt. Charles Williams, noncommissioned officer in charge for the SCANG Chaplain Corps, attended a three-day symposium in Bogota, Colombia, discussing how religion matters to military commanders, service members and their families, July 13-16. Washington, DC — CSC Chaplain, Ch, Lt Col, Brian L. Bohlman, SCANG, offered the opening prayer at the U.S. House of Representatives on July 25, 2015. The prayer may be seen on YouTube. DOBBINS AIR RESERVE BASE, GA — Although Chaplain (Maj.) Olga Westfall, 94th Airlift Wing chaplain, provides spiritual services during unit training assemblies, it has not always been that way for her. Westfall was born in Dnepropetrovsk, found in Eastern Ukraine in the late 60’s. During her time as part of the Soviet Union, the thought of God was prohibited. The Bible was a prohibited book in the country because it contradicted the teaching of the communist party. Those believed in God or religion would be persecuted, killed or thrown in jail. It discouraged Westfall to see so many people in pain and suffering. At one point, she felt like life had no meaning or purpose. Her path to become a chaplain did not come quickly or easily. “If you were to ask me 30 years ago if I was going to be a military chaplain for the United States military, I would laugh and say that it was impossible,” Westfall said. Nonetheless, over time Ukraine has accomplished the goal of religious freedom throughout the country, which Westfall said she believes is a great step forward for her country. The chaplain said she struggles with insecurity because of her accent and wonders if people understand her. However, she feels that she is doing God’s will and strives in her duty towards Him. Overall, Westfall has overcome many struggles in her life to be where she is today. Through her hard work, dedication and faith in God, she has found a way to thrive in the military serving proudly for the United States. She enjoys helping people out in a positive way and putting smiles on people’s faces. www.saybrook.edu — Frank Muñoz is a PhD student in the School of Mind-Body Medicine at Saybrook University. Frank has worked for the last 12 years as a clinical chaplain in a hospital setting with a clinical specialty is palliative care chaplaincy. He also has a background in Army and Air Force chaplaincy. In 2010 Frank received a grant from the National Institute of Health and National Cancer Institute to train as a healthcare researcher. The grant provided funds to pay for a doctorate degree as part of research training, which inspired him to choose enrollment in Saybrook University’s School of Mind-Body Medicine. Frank was drawn to the Mind-Body Medicine PhD program due to its innovative and creative spirit. As a clinical chaplain, Frank works with patients and families in emotional and spiritual distress. This felt distress is usually rooted in the physical and emotional pain of a terminal illness. In his pursuit of higher education, Frank sought to learn various techniques that would help support human beings overwhelmed with the burden of a life-threatening diagnosis. In his pursuit of knowledge, skills, and understanding, Frank was particularly drawn to research studies showing that meditation, hypnosis, and guided imagery can alter gene expression. Modifying gene expression: Current research shows that the human genome defines a range of possibilities, including illnesses such as cancer or autism. Many factors, from nutrition to stress to lifestyle, can determine whether and how much these genetic possibilities get expressed in a particular individual. Frank's research focuses on measuring how much spiritual care and mind-body techniques can positively modify gene expression. Meditation, hypnosis, and imagery techniques provide ways to manage chronic stress, while also providing support for self-awareness and the search for meaning. Frank has found a substantial body of research documenting the efficacy of mind-body modalities in influencing gene expression. Frank's research has resulted in two poster presentations and one published abstract. 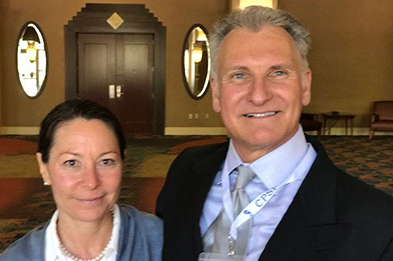 The Association of Professional Chaplains (APC) accepted Frank’s poster on “Spiritual Care and Gene Expression.” At APC Frank intends to share what he has learned thus far in his doctoral journey on the measurable effects of spiritual care on gene expression. He is scheduled to present this poster at APC’s next national conference in June 2015. 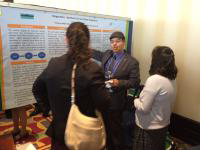 In November, Frank will present a second poster at the national conference of the Center for the Advancement of Palliative Care’s (CAPC). In that poster, he will share how he captures, in electronic charting, the effects of palliative care patients’ religious or spiritual beliefs on their healthcare choices and preferences. Additionally, the American Society of Clinical Oncology (ASCO) has accepted an abstract on Frank's research for publication. In a pilot study, Frank measured the effects of the Mind-Body Medicine Epigenetic technique (MET) on p53 gene expression. 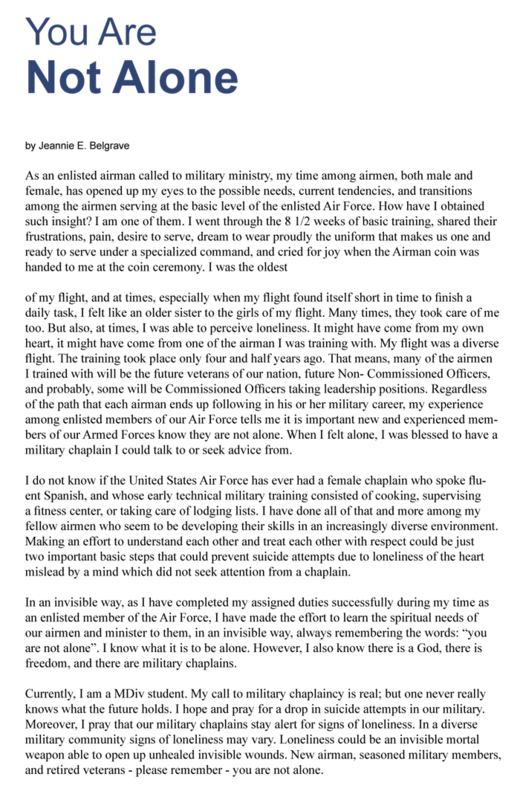 The expression of the p53 gene is important in the control of cancer growth. ASCO has published Frank’s abstract on their website. Frank intends to continue his studies on the potential of mind-body modalities to modulate gene expression. 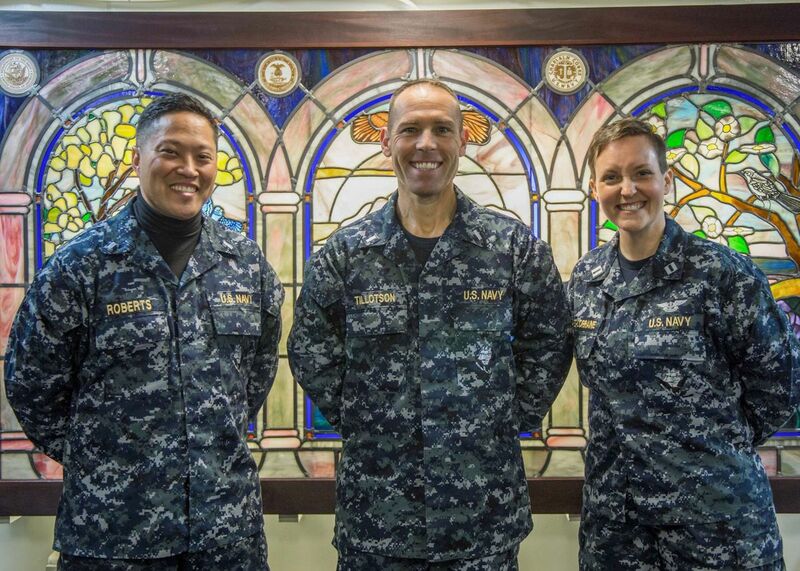 CSC Chaplain Offers Opening Prayer for "Navy Day"
www.tvw.org — CSC Navy Chaplain Janet Clarke offered a prayer for the opening of the Washington State Senate on their “Navy Day,” February 11, 2015. She can be heard at the 7:45 point in the following recording. 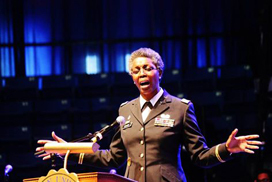 Hampton, VA — CSC Chaplain (CPT) Sharon Browne, US Army, was honored to offer the Invocation for the Communion Service at the historical and prestigious 100th Hampton University Minister’s Conference in June 2014. 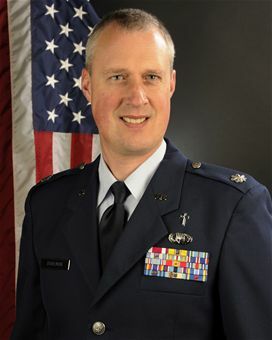 MCENTIRE JOINT NATIONAL GUARD BASE, S.C. — Chaplain, Lt. Col. Brian L. Bohlman, assigned to the 169th Fighter Wing at McEntire Joint National Guard Base, has been awarded the Samuel Stone Award in recognition as the Air National Guard's Chaplain of the year in 2013. 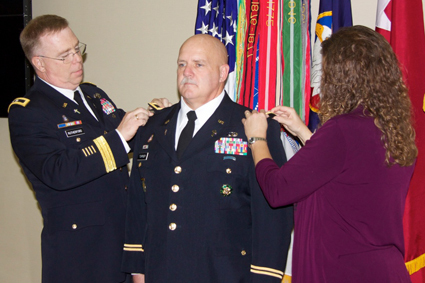 "I feel honored that I get to lead a great Chaplain Corps," said Bohlman. "We have a team of great people." The Samuel Stone award is named after the late Chaplain Samuel Stone, the first recorded chaplain to serve in the militia of colonial America. The annual winner is based on training accomplishments and contributions to mission support, leadership contributions to military or civilian community and enrollment in off-duty programs of professional self-improvement. Bohlman enlisted in 1992 as a chaplain assistant and was ordained in 1996. Today, Bohlman is a dedicated staff officer accomplishing many feats. These include being the first certified instructor of the Spiritual Resilience curriculum, serving on the Military Chaplains Association Executive Committee and leading Strong Bonds retreats. Currently a drill status Guardsman, Bohlman makes himself readily available to assist the full-time needs of approximately 1,300 Airmen. Last year he served almost 130 duty days to aid in the mission of the 169th Fighter Wing. He also contributes part-time as a healthcare chaplain and as an adjunct professor of practical studies for Liberty University. Bohlman emphasized the importance of availability in order to meet mission requirements and the spiritual needs of the people. Airmen value a chaplain beyond times of personal crisis. The importance of the Chaplain Corps is essential for overall spiritual health through faith or an individual's personal belief system. Drawing inspiration from daily events, Bohlman distributes these life lessons throughout the staff and service members. He commented that caring for the needs of others ensures that the mission will always be accomplished. One of Bohlman's most defining periods happened while deployed at Bagram Airfield, Afghanistan in 2012. There he spent time helping severely wounded warriors at the Craig Joint Theatre Hospital. Bohlman stated that working with amputees in the hospital setting helped him to better understand resiliency. "It gave me purpose and meaning to never give up," said Bohlman. "God can use any tragedy and help people to find meaning and purpose and actually triumph." Bohlman attributes the ministry of presence of the SCANG Chaplain Corps as the most significant component to winning the Samuel Stone award. "Visibility is key," said Bohlman. "Building relationships with the Airmen is important to earn the right to help in a time of need." 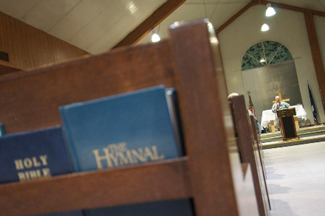 In June, Bohlman plans to refresh Sunday worship services. His Chaplain Corps will also begin unit walk-through visits with Swampfox Airmen to build meaningful relationships in order to care for the souls of Airmen in their time of need. CSC Chaplain Lexis Gibson Aleigha Kennedy received the Wilson Award at the MER Regional Conference April 5, 2014. 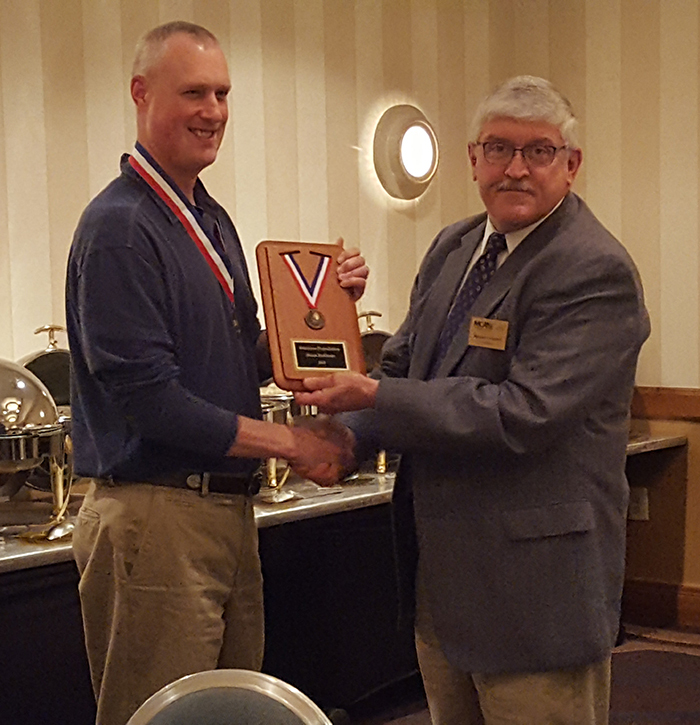 The award was presented by CAP National Commander, Gen. Carr. and the daughter of Col. Gil Robb Wilson (the Founder/Organizer of CAP). The final milestone is the Wilson Award. It is earned after receiving the Paul E. Garber Award. In addition, members must direct the training of fellow members in a variety of courses. He or she must also have served in command or leadership positions for at least three years. Finally, he or she must have completed CAP’s capstone course, the National Staff College, or approved equivalent. As CAP’s premierpletes five increasingly complex training levels. Each level requires the member to become more involved in CAP activities, master skills in one of 23 technical areas, and develop leadership ability. As he or she completes these levels, the member receives awards, chances for promotion, and selection for more important roles within CAP. FRANKFORT, KY — Angela White knew at a young age she wanted to wear a uniform and serve her country. So one day when she saw a Marine Corps recruiter at her high school in Montana, she walked up and said she wanted to enlist. The recruiter told her no. 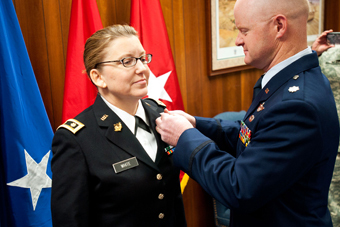 Twenty-five years later, White was sworn in as a major and the second female chaplain in the Kentucky National Guard during an appointment ceremony in Frankfort, KY, Feb. 21. It has been more than 25 years since a female has served as a chaplain in the Kentucky Guard, a fact White says contributes to the idea that things happen for a reason. "I was called to join the military," she says. "God has healed me in so many ways. God revealed to me my way; this is what I was meant to do. If you feel called by God, he will make a way for you. It's the truth. And Kentucky is a fine place to be as a woman in the chaplaincy." White never understood why the Marines didn't even give her a chance. She would later walk to a recruiting station and into the Air Force office. After several years of service as a bomber mechanic, then an Army nurse, the adventurous mother of two began her next chapter in uniform. "I was off on an adventure when I wanted to be a Marine, and it was exciting to work on big aircraft, and I've always cared about people, so that was the nursing step. Now I'm off on an adventure with people I care about," she says, trying to make sense of her own career steps. "The military life is a challenge, we all have an adventurous spirit, and God loves that." White says the path to becoming a chaplain was challenging but credits her family's support as her driving force, recalling the constant encouragement she received from them. "My husband is my biggest fan. My daughter would put little notes in my bags when I left for training that said 'Mommy, you're going to do great!' I keep one of those in my wallet today." White is married to Lieutenant Colonel Jamie White, a pilot with the 123rd Airlift Wing of the Kentucky Air National Guard. "We're so proud of her," Jamie says. "She has accomplished a lot, she's always been on the edge in the military, never being afraid of a job, and she's been preparing for this for the past twenty-five years." The family of four now resides in Shelbyville, KY, where White serves as liturgist, Sunday school director and peer counselor at a local pregnancy resource center for single and low-income mothers. She will serve as chaplain for the 1204th Aviation Support Battalion in Burlington, KY. Chaplain (Major) Bill Draper, 63rd Theater Aviation Brigade chaplain, says White is just whom the Kentucky Guard needs to serve in such capacity. "Chaplain Angie White's prior experience as an Active Duty enlisted Airman, Soldier and officer will help her build solid relationships with Soldiers and staff members alike," says Draper. "This will enable her to provide religious support that is both intentional and genuine." Lieutenant Colonel Yong Cho, state chaplain for the Kentucky Guard, swore White in during the ceremony and says it was a good day for the Guard. Cho also spoke of White's unique background and how it will help her in the future. "All of the chaplains are happy for her and her family today; it has been a faithful road for her," says Cho. "Chaplain White's skills and military service will only enhance her ministry, and she will bring diversity to the Chaplain Corps." White is glad that she has accomplished her newest challenge and doesn't concern herself with the minority aspect of her position, just the way forward. "I'm so excited today, it's finally here, to start this journey, but there are a lot of great female chaplains out there, maybe it just wasn't the right time here," she says. "It may be nice to hear that I'm the first in a long time, but this is about being a chaplain, being part of a family and working with Soldiers." "I Will Revolutionize the Way People Look at Chaplains"
Chaplain (1st Lt.) Tony Davy is the newest member of the Iowa Air National Guard 132nd Fighter Wing's Chaplain Team. As a young man growing up in Independence, Iowa, he felt the call to ministry at the young age of 11. This started him on a spiritual journey that has led him to a better understanding of the power of spirituality and diversity in religion. After high school he worked as a counselor at a boarding school and looked for opportunities that he thought would help people. He then decided that the military would be a good place to gain insight in the world and maybe help him grow as a person. "I'll join the guard for a couple years and see," he said in May of 2003. Davy first served as a traditional enlisted member in the Logistics Readiness Squadron for 9 years. He was selected in 2008 as the 132nd Fighter Wing Non-Commissioned Officer of the Year. After finishing his Bachelor's Degree in Business from Upper Iowa University, he earned a Seminary degree from Liberty University. It was now time for Davy to decide what direction he wanted his military career to go. Davy's motivation to become a Chaplain came from interacting with his peers on drill weekends and several overseas deployments. "People in uniform come into contact with more reasons to look to the divine," he says. In Davy's 20 years working in ministry he learned that spirituality can be the key to a better society as a whole. "We can make the world a better place, one person at a time. We have the ability to help others, but often we choose not to. Don't be concerned about, 'what's in it for me', says Davy. Being a good person is not specific to any religious affiliation. Chaplains serving in the United States military need to be prepared to offer spiritual guidance regardless of someone's religious or spiritual beliefs. "We [Chaplains] give everyone access or the right to worship as they choose or the right not to do anything. We treat the people around us appropriately, regardless of religion. If you get strength from a religion we want you to practice that regardless of the religion. Spirituality supplements our relationships with everyone," explains Davy. The US military is a culturally rich, interfaith environment as is the Chaplain Corps. 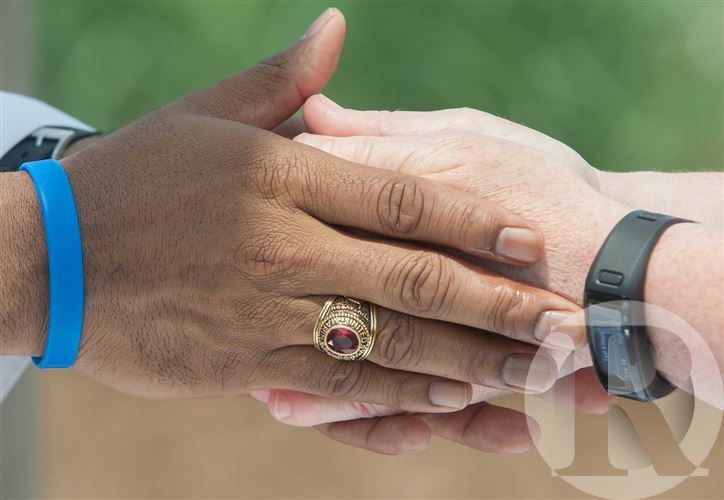 Chaplains can specialize in Muslim, Protestant, Jewish, Greek Orthodox, Catholic, Buddhist, Hindu or Sikh beliefs. They are not however limited to just those areas. All Chaplains should be able to council, support and advise any other area. Davy has 2 objectives to reach his goals as a chaplain. First, make himself available to anyone who wants to speak of a spiritual nature. "We don't always see that we are spiritual, but crisis in our lives can make us come to grips with our spirituality," he says. The second goal is to increase participation in base worship services. Davy understands the challenges of people making themselves available on busy drill weekends, but wants to create an excitement or buzz around worship. "There is strength in numbers, we can create synergy with more people, and on an individual basis it boils down to connecting with the person next to you." Lt. Davy says, "I will revolutionize the way people look at Chaplains." All of us should be in the ministry, all the time. Chaplains are stewards of community and citizenship. Community is common and unity combined. Too often, we just want to be us, but we have to help each other. Being a good wingman does not stop at the end of drill weekend. We need to be wingmen for other citizens to help the world be a better place. "Assisting other people will give us more fulfillment in our own lives. We should be reaching out every day to minister hope and address needs with people we come in contact with every day," he says. As military members, it is important for us to “tell our story” as a healthy way of processing the emotional impact of serving in harm’s way, especially after returning from deployment. 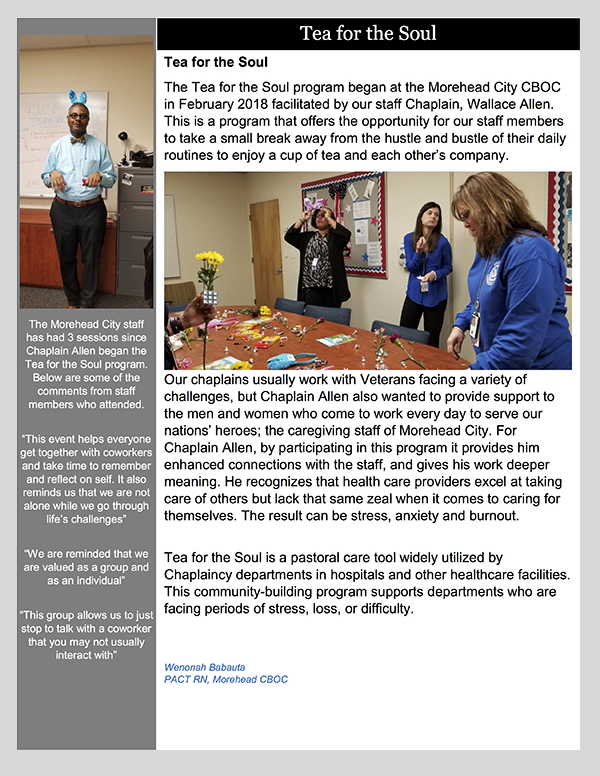 During my last week as a hospital chaplain in Afghanistan, I gave a behind-the-scenes tour of the facility to some public affairs staff members who later wrote an article about chaplains caring for the warrior’s soul. It was a divine encounter. Before they left, God used me to care for their own souls while using them to help me tell my story—which is hard to do at times. I provided ministry to over 1,500 wounded warriors with many asking me to pray for them, their families, and especially the members of their unit they’d left behind. Regardless of their faith or beliefs, I always took the time to listen to their stories of grief and pain, and then thank them for the sacrifices they had made for freedom. During this tour, my fifth deployment, I also had the privilege of ministering to and helping the devoted doctors and nurses who rendered their medical expertise to the injured. These caregivers are forced to keep their feelings and emotions out of their difficult work, often confronted by unique challenges such as providing the same level of care to both a prisoner of war and the very soldier the POW wounded. These medics sometimes just need to talk to someone. As a Christian chaplain, my ministry model resembles Christ’s own—walking the road with grief-stricken men, asking them questions, taking time to listen to their pain, and offering comfort from Scriptures (Luke 24). Combat zone ministry presented me with unique perspectives on faith and fear. My faith was tested every time there was indirect fire from an incoming rocket or mortar attack. I had to deal with my own fears that I could be severely injured—or never return to my family. A suicide bomber north of our location detonated himself near a playground, killing and injuring over thirty innocent victims, including three American soldiers. While assisting the medical staff, I noticed that much of the trauma floor was covered in puddles of blood, including the soles of my tan boots. It reminded me of a World War II photo of a chaplain kneeling next to a soldier with boots covered with mud. The photo caption described how chaplains must be willing to get dirty in order to bring ministry to service members wherever they are serving—in the field, the woods, or a tent. Or in a hospital trauma unit, covered with the blood of America’s bravest men and women who sacrificed themselves for freedom. Since returning from my tour, I am continually reminded of something I once heard, Freedom has a taste to those who have fought for it, and almost died, that the protected will never know. Since the earliest days of our nation, every generation of Americans has answered the call to duty in times of peace and war. I may never again see the unsung heroes I served with, but I will always remember them and treasure the opportunity of ministering God’s presence, care, and hope to them as we walked our portion of the Emmaus road together. Originally published in the October 2012 issue of COMMAND magazine, Vol.61 No. 5, by Officers Christian Fellowship of the United States of America, Englewood, Colorado. Reprinted/used with permission. For information on the work and mission of OCF or how to become a member, contact OCF: www.ocfusa.org or 1-800-761-1984. About the Author: Chaplain Brian Bohlman is a life member of the Military Chaplains Association and served on the MCA National Executive Council from 2010-2013. He currently serves as the Wing Chaplain, 169th Fighter Wing, McEntire Joint National Guard Base. He also serves as a chaplain at a behavioral health center and as an adjunct professor of chaplaincy ministries at Liberty Baptist Theological Seminary. He is the author of So Help Me God: A Reflection on the Military Oath and For God and Country: Considering the Call to Military Chaplaincy. BAGRAM AIRFIELD, Afghanistan (AFNS) — The chaplain gave the cross he brought from home to the young Marine from Florida who was injured. The Marine, who was engaged to a girl in Jacksonville, Fla., had been injured in a roadside bomb explosion and lost the cross that was on his body armor. When the chaplain presented the cross to the youthful Marine, both men cried. This was Chaplain (Lt. Col.) Brian Bohlman's first experience as the night-shift chaplain at Craig Joint-Theater Hospital here approximately six months ago. 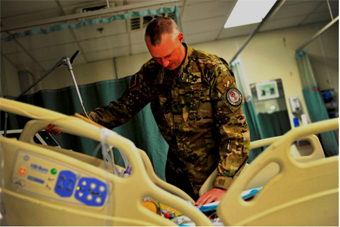 The chaplain would experience these types of scenarios and more throughout his time at CJTH, one of the largest and best-equipped trauma facilities in Afghanistan. Anytime a trauma patient comes in to the hospital, the chaplain's pager goes, he said. 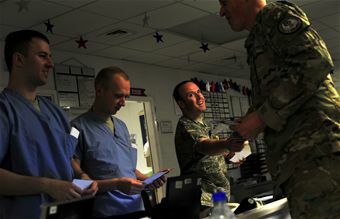 "Our role in the trauma room is to introduce ourselves, and we tell them we are praying for them," said Bohlman, who is deployed from the 169th Fighter Wing at McEntire Joint National Guard Base, S.C. "We will also follow them while they are in the hospital." The chaplain doesn't only deal with trauma, but also makes hospital visits to patients who are stable. "(The chaplain's assistance and I) generally see about 15 people a night," Bohlman said. "I always ask them their hometown." Bohlman always had a strong internal call to serve, he said. He didn't meet the requirements to serve as a chaplain, so he came into the military in 1992 as a chaplain's assistant. After serving four years on active duty and a year in the Reserve, he earned a commission through the Air Force Chaplain Candidate Program. "Our mission is to care for the warrior's soul," Bohlman said. "There are three functions we do: one is nurturing the living, two is caring for the wounded and three is honoring the dead. On this deployment, I've done all three, but I definitely prefer the first." The rosy-cheeked chaplain carries a small green book from his left breast pocket. Though, the book is not worth more than a couple of dollars, this book holds a much deeper meaning. Every injured military member Bohlman has come in contact with resides in this green book. Their name, rank and service are typed on a name tag in the book, but what makes the pages special are the notes he has written about each individual. "I try and write a little bit about everyone I meet," he said. There are particular service members who have stories that have stuck with Bohlman --the Army quadruple amputee, the suicide victims and those who didn't make it. "In April, we had a lot of traumas," he said with sadness. "At one point there were four patients in the trauma room, and I looked down and realized there was a lot of blood on floor. I still have those stains on my boots. I thought about the sacrifice and how our job can be dirty one. I just thought about how they truly left their mark on me." After his first week at the hospital, Bohlman told the staff that he can pray and chew gum at the same time, meaning he could help out if it was needed. "I was taking temperatures, putting on the blood pressure cuff and getting warm blankets," he said. 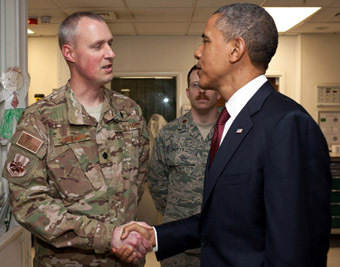 Chaplain Bohlman has been great," said Maj. (Dr.) Micah Schmidt, an emergency room physician. "He participates in all the traumas. He is very helpful. It is not expected, but it's nice. Just the other night, he helped me change the dressing on a gunshot wound." It's not just the patients the chaplain watches after, but also the staff members who work at the hospital. "We're here to listen to their stories," Bohlman said. "A lot of times, the staff will compartmentalize what they deal with. You can have an enemy prisoner of war and the Soldier who was injured by the enemy POW, but you have to give the same exact care. They have to keep their feelings and emotions out of it." "I usually ask if they've talked to their family lately," he said. "Are you taking the time to exercise? How are you processing what you are seeing? My goal is to build resilient Airmen. I tell them I'm here regardless of their faith or denomination. My job is to provide care for their soul." A lot of times, they just need someone to talk to, he said. "They have seen a lot but the way they deal with is knowing that many would die if they weren't here," he said. "They see the big picture. It helps them during difficult days to pull through." While this is the chaplain's fifth deployment overseas, losing people never gets easier, he said. "At the end of the sermons I give, I have a slideshow of the service members I've worked with who have died, and I always tell my congregation, 'these are the faces of freedom!'" he exclaimed. Lt. Col. Brian Bohlman, a U.S. Air Force chaplain, graduated from Columbia International University in 2000 with a Master of Divinity degree. Today, he finds himself in one of the world’s hotspots – Afghanistan. As a military chaplain Bohlman is what CIU Chaplaincy Professor Michael Langston calls "the bearer of the presence of God – the physical reminder that God is always with us." From Afghanistan, Bohlman talked about his work in an email conversation. I have been deployed since March 2012 from my Air National Guard unit in Eastover, S.C. and serving at Craig Joint Theater Hospital, Bagram Airfield, Afghanistan. As the senior hospital chaplain at the only trauma center in Afghanistan, I oversee and deliver pastoral care to 528 Joint Medical Staff who provide urgent health care to U.S. and Coalition Forces, Afghan National Security Forces, contractors, and local nationals. What is the relationship between those you minister to and the chaplain? How do they view you? My primary mission is to offer spiritual care to every wounded warrior who comes through our facility. In most cases, patients usually stay here for 24-48 hours before being transported to Landstuhl Regional Medical Center in Germany. I am viewed by the medical staff and wounded warriors as the one who cares for their soul or their spiritual health and emotional well-being. 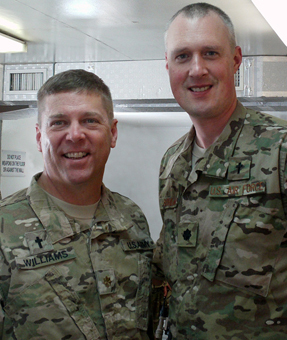 While in Afghanistan, Chaplain Brian Bohlman (right) met up with another CIU alumnus, Army chaplain, Major Michael Williams. Do they trust you? Why do they come to you? Do you seek them out? As a chaplain, my ministry philosophy involves building relationships with the people I serve alongside so that I can offer pastoral care and counseling to them when they go through a difficult time or crisis. In a matter of days after my arrival, I found myself counseling staff about how to better care for themselves after being exposed to injuries of severely wounded service members. Caring for the caregiver is crucial in a hospital setting – especially when located within a combat zone – and that is why I have several confidants back home to help me process what am I experiencing over here. Are many of those you minister to "churched?" What is their view of God? I have met hundreds of patients from a variety of religious faiths groups and denominations as well as a few atheists and agnostics. Many ask me to pray for them, their families, and especially the members of their unit that they left behind. Regardless of their faith or beliefs, I take time to listen to their personal stories of grief and pain and always thank them for the sacrifices they’ve made for the freedom of others as well as comfort those of Christian faith with Scripture, usually from the Psalms. My ministry model resembles that of Christ as he walked on the road to Emmaus with two grief-stricken men, asked them questions, took time to listen to their pain, and offered comfort from the Scriptures, and then disappeared from their sight (Luke 24). I may never again see the wounded warriors that I meet in this trauma hospital, but I will always remember them and treasure the opportunity to provide them with a ministry of presence, care, and hope. 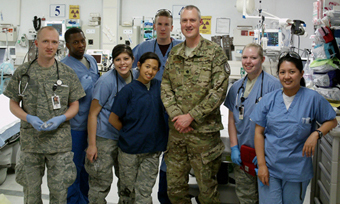 Chaplain Brian Bohlman (center) with the night shift at the Craig Joint Theatre Hospital, Bagram Airfield, Afghanistan. How did your CIU experience help you in the position you find yourself in today? I have used the skills acquired in the various crisis counseling classes taken at CIU. I have also developed a relationship with CIU Professor of Chaplaincy Ministries and retired Navy Chaplain, Dr. Mike Langston. I hope to use my deployment experience to help CIU students in the new Master of Divinity chaplaincy track as they prepare to serve in the military as chaplains. The chaplain at Dobbins Air Reserve Base said Easter is an important time for many who serve. 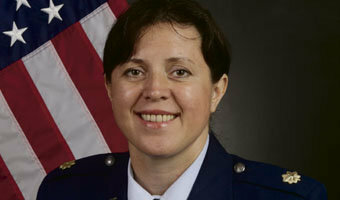 "It’s all about sacrifice," Major Olga Westfall said. 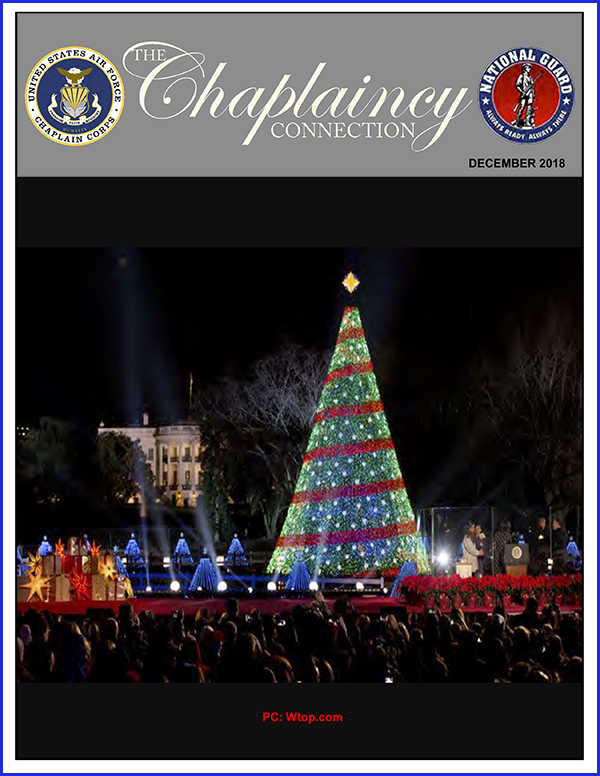 "For all the service members of the Christian faith, this season is very special. We all have in common one of the values: The focus is on service before self." Westfall, 43, leads services and counsels individuals for service members at the reserve base when they are there for drills. 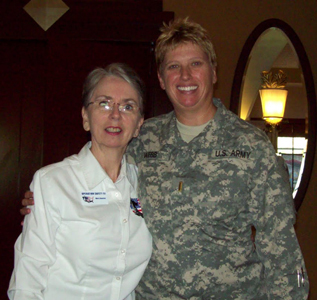 A former Army chaplain, her full-time job is chaplain at the Atlanta VA Medical Center. "Both places are very, very big," she said of the VA hospital and Dobbins. "But it’s wonderful because it makes me feel fulfilled." Serving as a religious leader in the U.S. military would have been hard to imagine for Westfall when she grew in Dnepropetrovsk, Ukraine, in what was then the Soviet Union. At the time, practicing religion was illegal in her country. "I think God has a sense of humor to bring a female from Ukraine to be a chaplain in the United States military," she said. "I think it is amazing. It is beyond my wildest dreams." While she is now married and living in Atlanta with her husband, Robert, and three children, two of whom were adopted from the Ukraine, Westfall said the job presents many challenges. Among the toughest is accompanying officers when they deliver the news of a service member who has died in combat to family members. "We would bring the news nobody wants to hear," she said. "It’s hard. I still have the memories of the people I have notified about the husband, the son, who was killed." But tough times can sometimes lead to the more rewarding outcomes, Westfall said. "I love that we can encourage, inspire," she said. "I had a service member who would talk and talk and talk. She just wanted someone to hear. A lot of people have the answers; they just need someone to listen. That brings happiness to my heart." Chief Master Sgt. Jeffrey Harold, a senior enlisted leader with the 80th Aerial Patrol Squadron at Dobbins, said between 20 and 30 members of the squadron attend a special church service at its training location each month. "Chaplain Westfall has done a wonderful job bringing us a word from the Bible, and has also given us personal anecdotes that have really captured the attention of everyone in attendance," Harold said. "Several service members, like many in the country, have been facing troubling times, particularly given the economy. Chaplain Westfall has really made a difference by bringing relevant words of hope and encouragement." Westfall also leads prayers at events on the base and elsewhere in the community. While she keeps her prayers nondenominational in front of mass gatherings, she is able to speak of Christ’s teachings during Protestant services. "That’s what they expect," she said. "That’s what they want." 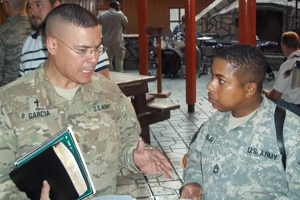 On December 6, 2011, Coalition of Spirit-filled Churches' Chaplain (COL) Kevin R. Turner, US Army Reserve, was promoted to Brigadier General at Fort Bragg, NC. Chaplain (BG) Turner is now the Assistant Chief of Chaplains for Mobilization and Readiness. 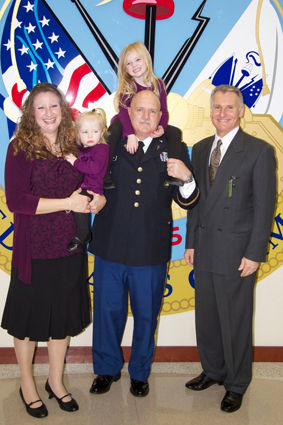 The photo is the pinning on of Chaplain Turner's stars by Chaplain (MG) Donald Rutherford, Army Chief of Chaplains, and by Lara Turner, his wife (and mother of their two precious girls!). As you can see, Chaplain Turner is a down-to-earth family man, with a lot on his shoulders! Our prayers and blessings are with Kevin that he make a difference to the Chaplain Corps, and we are convinced that with the Lord's help, he will! Chaplain (Maj.) Edward R. Baccich, 401st AFSB chaplain, invited a special guest to his Sunday evening contemporary service. 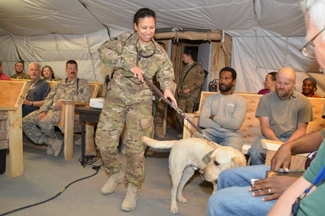 Maj. Timmy, a combat stress dog, and his handler Capt. Christine E. Beck joined the congregation. Major Timmy played catch with the chaplain and other members of the congregation and made a lot of new friends in the process. Editor's Note: Chaplain Brad Cedergren is a CSC Chaplain. Soldiers of the Minnesota National Guard's 1-194 Armor Battalion pray before leaving on a resupply convoy into Iraq on September 6, 2011. 5 EYEWITNESS NEWS reporter Mark Albert and photojournalist Chris Hansen embedded for most of September with the Minnesota National Guard in Iraq and Kuwait. The 2,400 soldiers from hundreds of Minnesota communities are in charge of providing security convoys to 46,000 withdrawing American troops and to protect bases in Kuwait where they will stage before the trip home. With them is CSC Chaplain Brad Cedergren, ministering to the troops. Please keep him and all US Troops in your prayers! Chaplain Brad Cedergren, of Albertville, delivers a sermon on Sunday, Sept. 4, 2011, inside the cavernous chapel at Camp Virginia in Kuwait. Chaplain Brad Cedergren preaches during Sunday night services on Sept. 4, 2011. 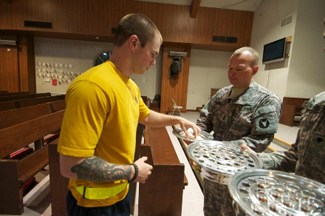 Chaplain Brad Cedergren offers communion to soldiers at Camp Virginia during a service on Sept. 4, 2011. Editor's Note: Chaplain John Heatley is a just-returned CSC Chaplain who was injured in Afganistan. Omaha, NE — There are some things you just can't put into words. One of those is watching a soldier surprise his family after being deployed. Friday night after the halftime show at Bellevue West's football game, the Heatley family was called down to the field for a special prize, which turned out to be a surprise homecoming from their dad, Chaplain John Heatley. "It's been a long, hard time," said Heatley. "I got injured while I was in Afghanistan. My unit returned a month ago. It’s just great to be back and spend time with my family." "I'm still shaking and I'm so excited and glad to have him home," Jean Heatley said. 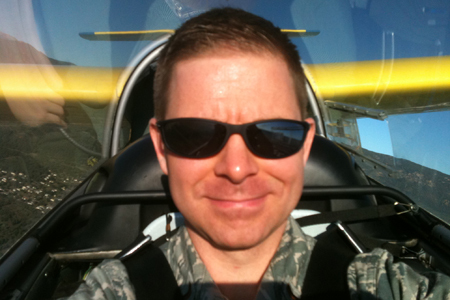 Editor's Note: Air Force Chaplain Candidate Matthew Hanzelka is endorsed with The Coalition of Spirit-filled Churches. 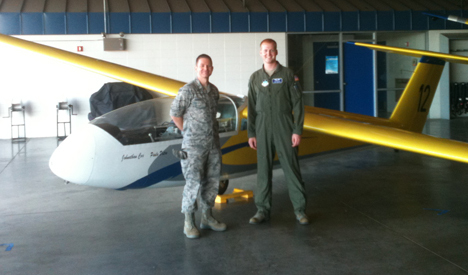 Air Force Chaplain Candidate Matthew Hanzelka prepares to take to the air at the Air Force Academy in Colorado Springs. Air Force Chaplain Candidate Matthew Hanzelka has just finished his 35-day training tour at the Air Forece Academy, Colorado Springs, CO.
"My training was an incredible experience," says Hanzelka. 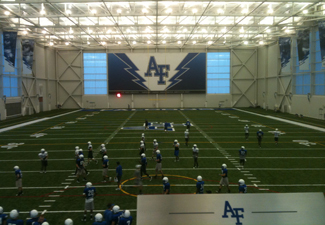 "Fortunately, I was selected to train at the Air Force Academy in Colorado; the staff there gave me an incredible amount of mentoring and responsibility during my 35 day tour." Hanzelka worked primarily with the 1100 basic cadets going through their 5 week Basic Cadet Training. At the Bicentennial Chapel liturgical worship service the worship is spirit-filled, liturgical and biblically orthodox (Three Streams Charismatic, Liturgical, and Evangelical). 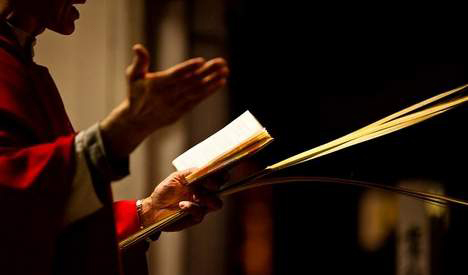 Our services reflect our appreciation for the best of both contemporary and traditional worship, based on the Anglican Book of Common Prayer Holy Communion Liturgy. At the heart of worship lies an encounter with Jesus through the Eucharist and a desire to see hearts healed and restored as we journey towards the point of Communion. The gifts of the Holy Spirit are welcomed and encouraged at all times, sometimes overflowing into, harmonizing and also taking control of the liturgy. Times of healing ministry are always available during and after the service. We are committed to ensuring that all of the people who attend the Bicentennial Chapel liturgical worship service have a genuine worship experience, providing special opportunities for them to understand and participate in the liturgy. Music is at the heart of our worship and is a blend of traditional and contemporary styles, enhanced with multimedia presentations. We hope you come out and join us in celebrating Holy Eucharist and fellowshipping with me and my wife (Seaborn and his wife Virginia) and the parishioners of Bicentennial Chapel. Seaborn has been married over 17 years and has been in ministry for 15 years. He has planted five different churches in various denominations and they have all grown to signifi- cant sizes. He is an ordained Anglican Priest that grew up in the Pentecostal church and his reflection of liturgy is energetic and expressive. Seaborn and his wife Virginia are both from Miami, Fla., and their flavor of ministry reflects that of multicultural diversity of South Florida and his Jamaican heritage. 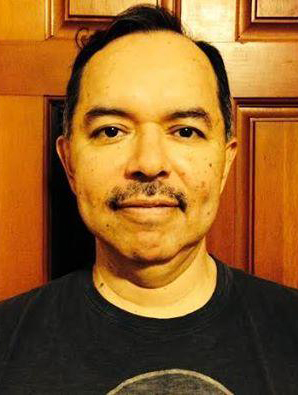 Editor's Note: Chaplain (MAJ) Ephraim Garcia is endorsed with The Coalition of Spirit-filled Churches. During the "New Comers" brief, I met Chaplain Garcia who also had just arrived at ISAF. We immediately connected and made a friendship. We both ran the 5K "fun run" and later saw each other at the Memorial Day picnic. He is full of life and full of stories - what a hoot! Chaplain (Maj.) Ephraim Garcia at the Memorial Day 2011 services at The Destille Gardens, Afghanistan. A short Puerto Rican American with a twinkle in his eye and a fire in his belly. He is on fire for God and loves his new assignment. This is his first tour as an Army Chaplain since he recently completed his seminary course work, having taken classes at night for the past eight years. He too is a mobilized reservist. In the civilian world, he serves as a minister of a church in Staten Island, New York, not far from where he grew up in Brooklyn, NY. 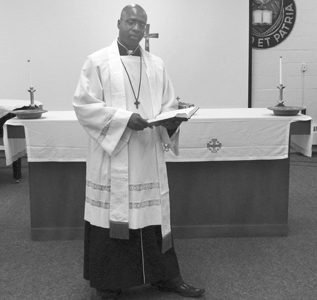 As a bi-vocational minister, he is also employed as a NYS Court Officer at Brooklyn Criminal Court. He knows all about the behavior of teenagers and their involvement in gangs. He can readily identify with the difficulty of teaching youth in our country. On his last deployment in 2007, he had served as a Coast Guard Hazardous Material (HAZMAT) Inspector. His wife of 27 years is back home manning the home front and very involved with their church. In fact, she even preached a sermon at their church his first Sunday here at ISAF. Pleasantly surprised and proud of his wife, he laughingly shared: "My wife has never preached a sermon before, but now she waits until I leave home to do so!" He comes from a Pentecostal background, and adjusts his spiritual enthusiasm and charismatic style to match his audiences. Since I attend both the traditional Protestant and the Inspirational or Gospel Rock Services, there is a marked difference in this presentation style. Not only does the Inspirational Service run a half hour longer since he draws energy from those gathered and shares more stories, but his sense of humor comes out profusely. I laughed so much Sunday evening listening to him preach that I was wondering if I was even in a church service (grin). It was all good stuff - lets just say that he knows human nature very well. He is a fine preacher and really loves the Lord. His last name of Garcia is Hispanic so I was curious if he had any Catholic background, and asked him. He smiled and said, "It's funny that you asked, because many people have asked the same question. In fact, when I first showed up in Kabul, they saw my name and immediately exclaimed, 'You must be the priest that we have been waiting for!'" Editor's Note: Chaplain Kevin Turner (Col.) is endorsed with The Coalition of Spirit-filled Churches. U.S. Department of Defense, Office of the Assistant Secretary of Defense (Public Affairs) — Coalition of Spirit-filled Churches chaplain, Army Reserve Col. Kevin R. Turner has been nominated by President Obama for promotion to the rank of brigadier general and for assignment as assistant chief of chaplains, mobilization and readiness, Office of the Chief of Chaplains, Washington, D.C. Turner is currently assigned to the control group (reinforcement), Saint Louis, Mo. The nomination announcement was made by Secretary of Defense Robert M. Gates on May 25, 2011. 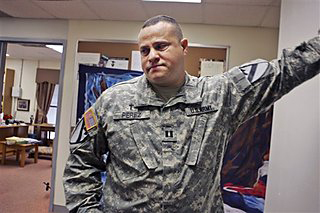 Editor's Note: Chaplain Leo Mora is a CSC active duty Army Chaplain. Editor's Note: Chaplain (CPT) John Heatley is deployed and is the chaplain for the 1-134th CAV and Camp Dubs & Julien. CAMP PHOENIX, Afghanistan — The pastor wears combat boots, the Bibles sport camouflage-pattern covers and the rack for assault rifles stands just inside the chapel door. 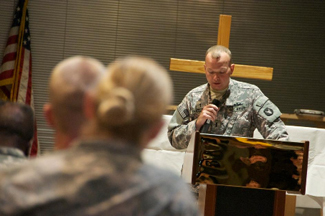 Lt. Col. Matthew Pawlikowski, a chaplain at Camp Phoenix in Kabul, Afghanistan, reads Scripture on Palm Sunday. Several chaplains at the camp were to lead Easter services. The stained-glass windows? Those are plexiglass and colored contact paper. This is Easter in a war zone at the Camp Phoenix Chapel. Most of the 300-plus soldiers in the Nebraska Guard's 1-134th Cavalry Squadron are deployed to this base on the east side of Kabul. And thousands of other Nebraskans and Iowans are deployed throughout the Islamic Republic of Afghanistan — troops who could easily find themselves walking to an Easter service today hearing the Muslim call to prayer in the background. There is never a good time to be so far from home, but the Easter season underscores the separation, as loved ones back in the Midlands color eggs, head to services at their own churches and gather for family meals. Maj. Daniel Williams, the Nebraska squadron's executive officer, attended one of the Palm Sunday services at the chapel. His 2-year-old son and 4-year-old daughter were going to the Easter egg hunt Saturday in La Vista, but their dad wasn't there for it. The Easter season highlights the sacrifices being asked of troops' families, he said. "Like other holidays and traditions in the family, it's a reminder that you're not there to sort of take charge, set things up, enjoy the fellowship," he said. "You're asking your spouse to do everything for you. Not just taking care of the kids but marking the holiday in some special way — whether they're painting eggs or hiding them in the bushes, or just being there to take pictures." At the same time, Williams said, the deployment has helped renew and inspire him through his Afghan interpreter, who goes by the name of Paul. He converted to Christianity in 2007, and the two attend church services together nearly every Sunday. Paul sings the hymns in English, his fourth language. The 38-year-old from Kabul knows that the potential penalty for converting to Christianity in this country is execution. His family knows he has converted, but he looks over his shoulder in fear that he might be discovered by others. He had a close call at a Christmas Eve candlelight service when he noticed at the last minute that Afghan television camera crews had shown up. He ditched his candle and sat at the back of the service. They went back later for the midnight service so Paul could join in the singing and praying. He hopes one day to move to America and attend church with Williams. "I will have my freedom," Paul said. Williams said his interpreter's situation illustrates the gulf that persists in the liberties available to those in the United States and in many other parts of the world. Several chaplains at Camp Phoenix will lead today's Easter services. The soldiers will hear how the followers of Christ cannot be separated from the Lord — by a failed marriage, by sickness, even by war. The squadron's chaplain, Capt. John Heatley, is assigned to a smaller group from the 1-134th, down the road in southwest Kabul at Camp Dubs. Heatley planned to hold 14 services across 11 days to mark Holy Week. "It's really the most significant holiday of the religious year," Heatley said. During his sermon today, he plans to talk about what the holiday is really about: the Resurrection of Jesus. He will also talk about events affecting the soldiers here, such as a recent attack on the front gate at Camp Phoenix. The service helps to provide troops far from home with a sense of tradition, he said — an oasis from the trials and tribulations of an overseas deployment. Heatley tries to make the chapel at Dubs just such an oasis. The chapel has comfy couches. Heatley's assistant takes his coffee seriously and serves only freshly ground, high-end stuff. "The whole point of that is to have someplace where people could go to unwind," he said. Getting soldiers to attend services overseas can be a challenge, he said. One reason is that while a church service is a comfort to some, to others it's a reminder that they aren't home. Also, in Afghanistan, Fridays are the holy days that everyone takes off from work. Sundays are regular workdays, and many soldiers have missions. The Nebraskans are closely tied to that local work schedule because they work as mentors with Afghan security forces and help to establish development projects, where they need to meet with local officials and contractors. That means Fridays are when they are most likely to be free. So Heatley holds services on Fridays. He also holds impromptu services with only a couple of soldiers, or even one, if the desire and opportunity are there. 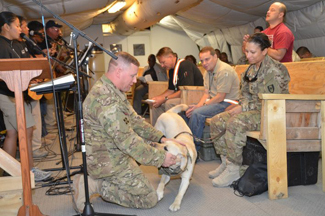 The Iowa soldiers at nearby Bagram Air Field can catch services at several locations around the base, including the Enduring Freedom Chapel. Capt. Kyle Obrecht of Council Bluffs, commander of the Headquarters and Headquarters Troop of the Iowa Guard's 1-113th Cavalry Squadron, attends services at that chapel. "Deployment is that time I use to fix myself," he said. "Here, we're not drinking, we're not going out and doing other things." He said Easter is a particularly special time. "With it being a family holiday traditionally, it is a little more tough to celebrate from here," he said. Sgt. Timothy VanLaningham of Dunbar, Neb., who's based at Camp Phoenix, said if it weren't for the deployment, he would likely be coloring Easter eggs with his 3-year-old daughter and having dinner with extended family. "It's sad because I'm missing it," he said. VanLaningham said he appreciates the opportunity to attend services on deployment. He's a correctional officer back in Nebraska and typically has to work on Sundays. He said church is even more important on deployment because of the uncertain security that soldiers face. "You never know," he said, "what's going to happen." Editor's Note: The following video clip features Chaplain Heatley's Chaplain Assistant. On February 18th the Buffalo Soldiers National Museum honored the ministry of Chaplains of the U.S. Armed Forces at its annual Gala. The Gala's theme was "Honoring Our Military Chaplains." 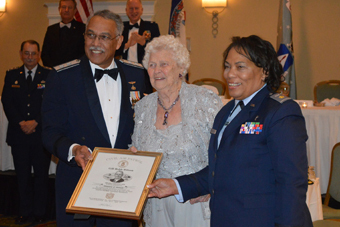 Coalition of Spirit-filled Churches chaplain, Captain Sharon Brown, was one of three honorees at the Gala event. Chaplain Brown is currently serving as the Battalion Chaplain for the 15th Brigade Support Battalion, 2nd Brigade Combat Team, 1st Cavalry Division at Ft. Hood, TX. For more information on the gala please download the Gala PDF here. 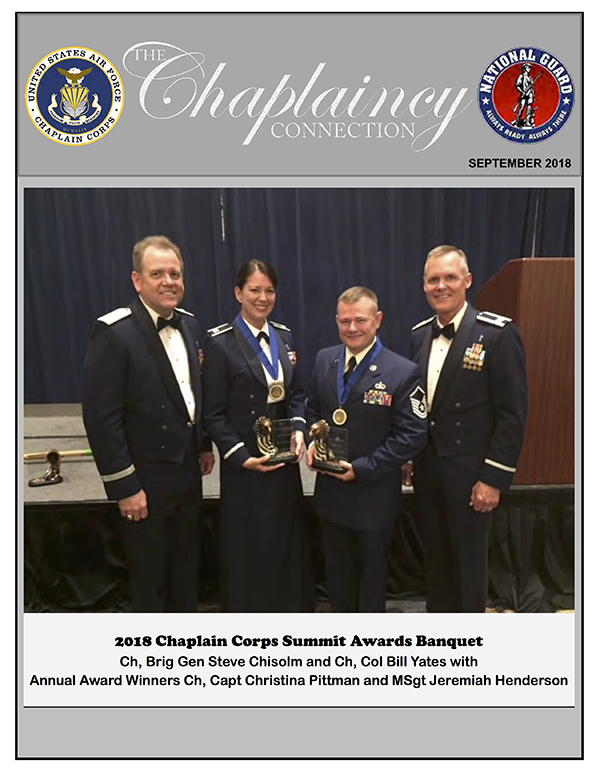 For more information on Chaplain Brown, please visit her bio at http://wisemancompany.com/BSMbio.html and scroll down to the "honorees" section. Editor's Note: Chaplain (MAJ) Stan Arnold is the Army Family Life Chaplain at Ft Campbell and he is a Licensed Marriage and Family Therapist. FORT CAMPBELL, Ky., Nov. 23, 2010 -- With almost all the 101st Airborne Division deployed to Afghanistan, military spouses here have their hands full taking care of each other. 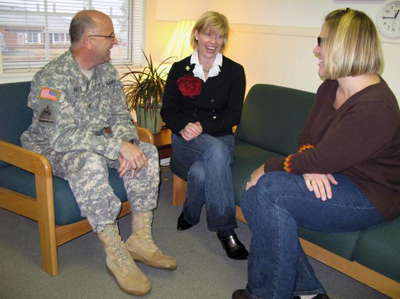 Maj. Stanley Arnold, family life chaplain at Fort Campbell, Ky., is working with Karin Jenkins (center), wife of Col. Sean Jenkins, commander of 4th Brigade Combat Team, and Rebecca Santos (right), wife of Command Sgt. 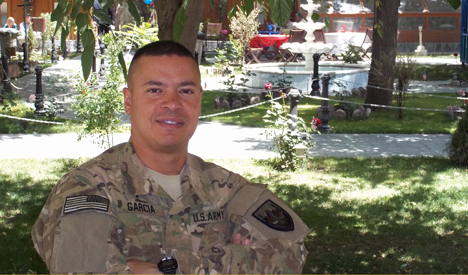 Maj. Hector Santos, the brigade sergeant major, to identify and address compassion fatigue among spouse volunteers. Day in and day out, they're called on to help a suddenly-single parent juggle work, kids and household chores, and set aside time to visit with the lonely wife who needs a friend. Too often, they find themselves consoling a widow who has just learned of her husband's death as they quietly wonder if they'll be the next to receive that dreaded knock on the door. Maj. Stanley Arnold, a family life chaplain here, praised the outpouring of family support that's become a hallmark of the 101st Airborne Division's "Screaming Eagles" and nearly every other military organization. But he's also concerned he's seeing signs of "compassion fatigue," with spouses already laden with their own responsibilities and burdens giving so much of themselves that there's sometimes little left to draw on. Last week's session was the first of an ongoing process Arnold plans to conduct with family leaders throughout the 101st Airborne Division as their loved ones serve in Afghanistan. He's hoping the message will resonate beyond the Kentucky bluegrass, and strike a chord with military families everywhere struggling to be all things to all people as they deal with their own deployment-related issues. Never is this support more important, or more emotionally and physically draining for the one providing it, than when it's for a family who has just lost a love one in combat, he said. "These spouses are really in a unique place," Arnold said. "They are back here, dealing with the families of our fallen Soldiers, and at the same time, dealing with the day-to-day ups and downs of being that single parent, with their spouse deployed in a combat zone and never knowing whether that knock on the door is for them." "We have incredible, caring, loving Family Readiness Group leaders. Why else would you step into a volunteer position that is 24 hours a day, seven days a week for a year or more?" she said. "They want to help. They love to help. That is their calling." "And because they are so caring, it is hard for them to say 'no' to another human being," Jenkins continued. "They will say 'yes' many times, and many times a day and many times a week, and they are still taking care of themselves and their families and saying 'yes.'" But as Arnold explained to Jenkins and other senior leaders' spouses, it's not only okay to say "no" and defer to someone else to help - sometimes it's critical. Arnold suggested various ways spouses can break the cycle the leads to compassion fatigue. They can take a few minutes to meditate, sneak off into a corner to read a book, soak in a bathtub, meet their "battle buddy" for coffee, whatever helps them relax and reenergize. Editor's Note: CH (CPT) Stacy Kervin is an Active Duty Army Chaplain and licensed professional counselor serving in Iraq and is endorsed by The Coalition of Spirit-filled Churches. When soldiers battling the horrors of war reach their breaking point, they turn to people like Capt. Stacie Kervin. "They've basically reached their last limit," said Kervin, an Army chaplain and Aberdeen (South Dakota) native. Kervin, 31, is serving in Iraq with the 85th Medical Detachment, a combat stress control team that provides counseling to soldiers dealing with combat stress. The team will be in Iraq for a year. Kervin went on active duty in February after eight years in the Army Reserves. Her deployment happened quickly - March 28 - but she said it was as if God was telling her: "You're ready." Already, Kervin's unit has dealt with an explosion involving six soldiers; two died. "That was my second day here," said Kervin, a 1997 Central High School graduate. Some soldiers who come to Kervin for help are suicidal. Suicides among veterans of Iraq and Afghanistan have plagued the military, with the Army seeing a record number last year, according to a Time Magazine report. Last year, 160 active-duty soldiers killed themselves, up from 140 in 2008 and 77 in 2003, according to a separate Time report (time.com). Kervin said she knows how to deal with this difficult topic - how to ask the right questions- because she's been through it. Her brother, Kevin Janish, who she said was struggling with depression, committed suicide eight years ago, she said. That's partly what prompted her to be a military chaplain. Now, she said, she helps soldiers process their trauma and get better. "That's the greatest thing when you can turn someone's life around," she said. Combat stress units are intense, she said. When the stress gets to her or another member of her team, which includes social workers and chaplains, they lean on each other. But Kervin said she dealt with similar situations during internships, including at Walter Reed Hospital. She's gotten used to it, so it doesn't affect her as much. But there are still times where it does affect her, including when a soldier is injured. "They're like a brother or sister," she said. But, she added, "It kind of makes you realize what's important in life," to value family and relationships. Being away from her family - husband, Michael, also an Aberdeen native; and son, Evan, 4 - is difficult. But they talk via Skype (this allows users to make video and voice calls over the Internet), which she said is an amazing communication tool. Kervin said her son never really cried when she left. Instead, she said, he told her, "Mommy, you go fight the bad guys, and I love you and I'm going to be a chaplain like you." Kervin said her mom and dad, Ron and Joanie Janish of Aberdeen, as well as other family members, know she is supposed to be doing what she's doing. It's her calling. So she doesn't worry about her own safety - she said she feels a sort of supernatural protection. Said Kervin, "When you're supposed to do what God calls you to do, you've got this protection." 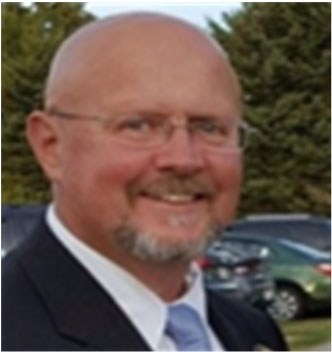 Editor's Note: Dave Plummer is also a full-time, operational hospital chaplain and was profiled recently in a healthcare newspaper. Chaplain David Plummer is a man driven by his devotion to God, to his family and friends and to every patient he comes in contact with as the team coordinator of Sentara CarePlex Hospital’s Chaplaincy Services Department. 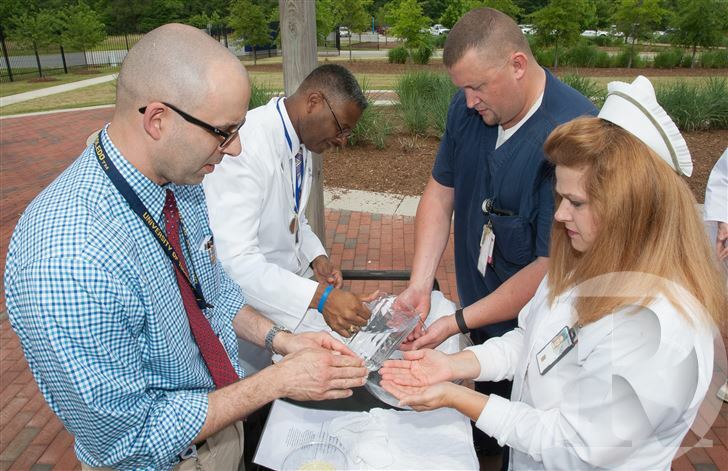 The department, which also serves Port Warwick Medical Arts in Newport News, is composed of over 30 volunteer clergy (both scheduled and on-call), five associate chaplains, as well as students from two seminaries and two graduate schools of psychology and counseling. Plummer began his career in chaplaincy as a volunteer nursing home chaplain in 1980. After serving in health care, correctional and military settings, he joined Sentara in 1999. There he immersed himself in the study of biomedical ethics (the philosophical study of the ethical controversies in health care settings), and in 2000, he completed a fellowship at the University of Virginia’s Center for Biomedical Ethics. 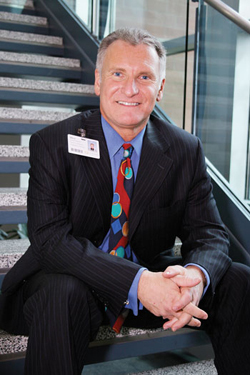 Today he serves as an ethics consultant to Sentara physicians at CarePlex as well as Port Warwick Medical Arts. He is co-chair of the hospital’s ethics committee as well as the research ethics consultant for the Sentara Center for Healthcare Ethics, which analyzes the moral and ethical questions confronting health care today. Plummer is also active with the Eastern Virginia Medical School Institutional Review Board, a committee charged with protecting the rights and welfare of research participants. "Growing up, we were in church on Sundays, attended Sunday school beforehand and also Wednesday night Bible study. It was the classic church experience where afterwards we would get together with family and friends to eat and enjoy each other’s company." In addition, he is responsible for clinical supervision of master’s degree practicum (first-year) students and interns (second-year students) at both the Regent University School of Psychology and Counseling and the Old Dominion University School of Psychology. Plummer is also pursuing a Doctor of Ministry degree with an emphasis on pastoral care and counseling at Regent University. In a recent phone interview with The Health Journal, Plummer, who is also a licensed marriage and family therapist, discussed religion, ethics, laughter and tears, and the roles these play in today’s health care environment. HJ: What life events led you to become a chaplain? DP: I really enjoy interacting with people and care about their struggles. I come from a religious background, and so it just seemed to be a natural fit. On a deeper level, there was a sensing by my inner person that this was what I was supposed to do. HJ: Did you attend a house of worship throughout your childhood? DP: My folks come from an evangelical background. Growing up, we were in church on Sundays, attended Sunday school beforehand and also Wednesday night Bible study. It was the classic church experience where afterwards we would get together with family and friends to eat and enjoy each other’s company. But even though I did all that, and would listen to and appreciate the Bible’s stories, up until my teens I was an agnostic. Later, through a number of events, I became convinced of God’s presence and his love for me and other people. That was my motivation to enter into chaplaincy. HJ: What part of your job do you struggle with emotionally? DP: The hardest part for me is when babies are brought into the Emergency Department and are not breathing and are unresponsive, and in fact, die. We have a number of SIDS deaths in the community, and from time to time we see abuse cases of babies and little children. As a dad, well, I instinctively think of my own child. I guess all the feelings associated with that kick in. HJ: What part of your job brings you the most joy? DP: My joy comes from talking with people and working with them. I experience it watching people in spiritual or emotional stress or duress come to a position of acceptance, where they are not in continuous turmoil over their circumstances or situation — that’s very satisfying. HJ: What makes you cry? DP: It’s hard to get me to cry, but when I do it is generally not a wailing cry, but tears of joy when I see something that is awesome and holy. To see a person achieve something or show tenderness to someone else, or when perhaps someone has made a personal breakthrough — that makes me tear up. HJ: What makes you laugh? DP: Spending time with my daughter. She has a wonderful sense of humor. Seeing her and hearing her comments—she just makes me laugh. She is the joy of my life. HJ: What frustrates and/or angers you? DP: Injustice, and when I see people being manipulated. In life, there are some very strong personalities—people who are used to getting their way and want to run roughshod over the values or wishes of others. I often see families who are very conflicted with one another about what the extent of treatment should be for Mom, Dad, Aunt Gertrude, whomever. Because of my experience with this, I cannot stress enough the importance of everyone having an advance directive, which is also called an advance medical directive. It’s a way for people to express to their physicians, the hospital and ultimately their family and friends what their wishes are if they are not able to speak for themselves. HJ: Tell us about the role of ethics in medicine. DP: The whole concept of ethics is doing the right thing by the patient. We need to make sure that the decisions that are made for patients who are not able to speak for themselves are in their best interest. On the research end, we need to make sure that if patients are given the opportunity to participate in a medical research study, the patient fully understands the benefits as well as the risks involved. We also need to minimize the risk to patients as much as possible. All patients deserve the best and safest health care available. Editor's Note: Chaplain (MAJ) Quentin Collins is now safely back in the USA. Chaplain Kevin Wainwright was preparing his Easter Sunday sermon in Iraq when there was a knock on his door. Army Chaplain Chaplain Jesus Perez pauses while talking about soldiers killed in Iraq during a tour of the chaplains offices at Fort Hood, Texas, Friday, Feb. 22, 2008. The news was grim: 1st Lt. Phillip Neel was dead. The young officer and fellow West Point grad had been a regular at the chaplain's Sunday church services. Wainwright knew and admired him. Now he had to find the right words to honor him. Wainwright chose the legend of Sir Galahad, King Arthur's noble knight, and the poetry of Alfred, Lord Tennyson to salute Neel in a memorial. He spoke of his compassion, his devotion to his soldiers. But in trying to understand Neel's death, the chaplain also posed an agonizing question: "Why does it seem that the good guys are the first ones to fall?" On Easter night, the sad milestone of 4,000 American deaths in the Iraq war was reached with an announcement by the U.S. military that four U.S. soldiers had been killed in a roadside bombing in Baghdad. As the toll approached 4,000, Wainwright and hundreds of other military chaplains in Iraq and across America wrestled with hard questions constantly. These are the men and women who pray with the mortally wounded, who administer last rites on bomb-scarred roads, who sit at kitchen tables with grieving families back home. Army chaplains such as Wainwright have been especially busy: Almost three-fourths of those who have died in Iraq were in the Army. Of the total lost in all services, more than 30 were just 18 years old; about 80 were older than 45, according to the military. Nearly 100 were women. A quarter of those who died were from just three states: California, Texas and New York. But for every number, there is a name, and for every name, a husband or son, wife or daughter whose life is remembered, often by a chaplain. "I'm the guy who knows all their stories," Wainwright says. "Of all the people in the battalion, the chaplain is the one who should know a little about everybody." In 14 months in Iraq, Wainwright comforted countless grieving soldiers, composed handwritten notes to families and conducted memorials, including one for Neel held last year at a concrete-barricaded chapel. "I remember them all," he says. Military chaplains don't carry weapons, don't engage in combat, and yet they know as well as any the human cost of war. When Kevin Wainwright arrived in Iraq in October 2006, it was his second deployment — he had served with the North Carolina National Guard two years earlier. This time he shipped out from Fort Hood, Texas. The Army captain knew what the dangers were, but he was optimistic. "I think we all go over there believing ... we're going to be that battalion that doesn't lose anyone," Wainwright says. Of the deaths in Iraq, more than 1 in 10 have come from sprawling Fort Hood, including some very personal losses for the chaplain: One was an airman he had given Communion to days before he was killed, one a soldier he had accompanied on patrol, another he had joined for dinner. Wainwright was familiar with the rhythms of life and death as a Presbyterian minister serving churches in Wisconsin and the Carolinas. But war was different. "It's personal," he says. "They WANT to kill you." And each soldier's death, Wainwright says, took a toll. "As a chaplain," he says, "you lose part of yourself that you're never going to get back." As chaplain for the 3rd Battalion, 8th Cavalry Regiment, Wainwright, 38, sometimes joined soldiers on patrols. He also tended to the injured. He was there to tell one wounded soldier after he regained consciousness that five of his comrades had died. Wainwright sat with him for hours, then gently told the survivor: "I'm glad you made it and you're here." He also was there to clutch the wrist of another soldier dying from shrapnel wounds to the head. He prayed in a circle with his friends, then stepped aside so everyone could say goodbye. Amid so much death, Wainwright remained steadfast in his beliefs. "My faith is not a stack of cards — it's rock solid," he says. "That doesn't mean I didn't grieve and think this guy is never going to know what it's like to be married or be a father. ... It hits home, too. You have those fears yourself. What would a loss be like for your own family? But if you dwell on that, it makes you less effective as a chaplain." Wainwright smiles as he recalls the time he had some unexpected help soothing souls. One day, he was trying to counsel a soldier when Eddie, a bomb-sniffing dog with a pitiful look, walked by. 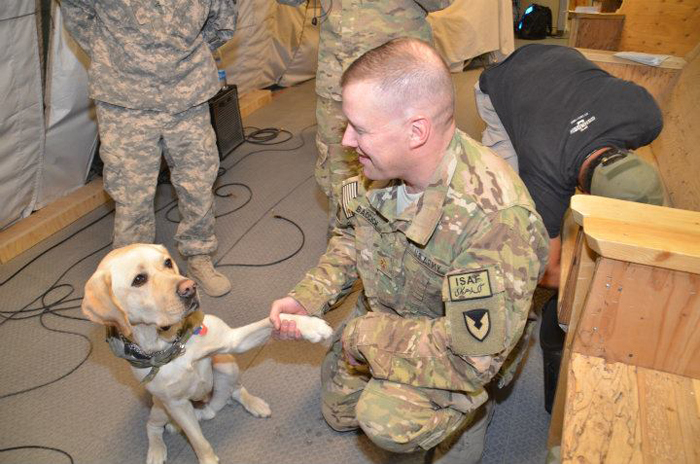 The distressed soldier petted the golden Labrador and instantly brightened. "I was trying to come up with some theologically significant interpretation of a life crisis," Wainwright says, "but that dog did more ministry in 10 seconds that I could do in a month." Sometimes he arrived by foot, other times by helicopter, but Chaplain Jesus Perez always had the same feeling when he visited a morgue in Iraq. "I had this sensation of emptiness," he says. "The place is so cold, even colder than you expect. You're losing somebody you probably know, or at least a brother in arms. But when you're there with your commander and rendering honor to the soldier who died, it's a solemn moment in the life of everyone in that room." 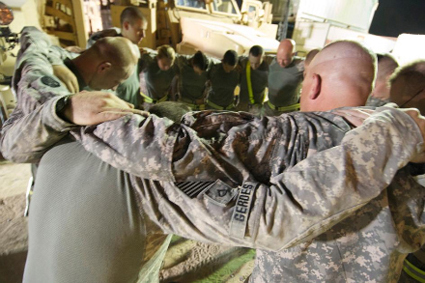 In 14 months, the Fort Hood chaplain prayed over 56 fallen soldiers. After the salutes and prayers were over, Perez, 43, always lingered behind. "I'd wait for everybody to leave, then I'd cry like a baby," he says. "I tried not to show my emotions in front of the other soldiers. I wanted to be strong for them. But when I was by myself, I cried. ... That was my way of coping with the situation." As chaplain for the Army's 3rd Brigade Special Troops Battalion, 1st Cavalry Division, Perez conducted several memorial ceremonies. He comforted the survivors, then took care of himself by talking with another chaplain or counselor. "I had to protect myself from burnout," he says. "There comes a time after you hear so many are dead, you become frustrated, there's some anger. You ask yourself: 'When is this going to end?'" But nothing he saw, he says, tested his faith. "I believe God has his reasons," says Perez, who is a Messianic Jew. "Who am I to ask why? I know a lot of people have that question. I don't have that answer obviously. Since I don't have the answer, I don't even ask it." In February, Perez received a poster he had ordered in Iraq that includes the names of 110 soldiers lost in his brigade. He plans to have it framed. "It will go with me everywhere I go," he says. "It will go with me if I go back to Iraq. Some people may forget their names, but not this chaplain." The Rev. David Sivret still lives with nightmares, headaches and memories of his brush with a suicide bomber. The Maine Army National Guard chaplain was severely injured in the Dec. 21, 2004, attack at a mess hall in Mosul, Iraq, that killed 22 people and wounded dozens more. Sivret has vivid memories of the day: sitting down for a roast beef lunch, saying grace, seeing a bright flash, waking up on the floor — having been thrown 10 to 20 feet — next to a soldier dying of catastrophic head injuries. "That's one of those dreams that haunts me," he says. "The floor was slippery with residue and blood. People were screaming and hollering." Sivret managed to stand, but he couldn't hear. He shouted some angry words — language, he says, "unbecoming a chaplain" — then collected himself and began praying with the wounded sprawled on the floor or on tables converted into stretchers. The chaplain moved outside, unzipping body bags to examine dog tags, performing last rites to those who were Christian. "I was running on adrenaline," he says. "I had a wicked headache. My left knee was shattered. My ribs were broken." But Sivret didn't let on, fearing he'd be hospitalized. "I wasn't going to leave them," he says. "They were my soldiers." National Guard members have accounted for 10 percent of the U.S. deaths in Iraq, including three men from Sivret's unit, two of whom were killed in that blast. One was Sgt. Lynn Poulin Sr. The chaplain had celebrated his marriage in Maine. The other was Spc. Thomas Dostie, whose parents had been Sivret's classmates, prompting the Guardsman to teasingly tell the chaplain: "'I know what you were like in high school.'" Sivret presided at a memorial for the two, breaking down outside before he spoke. He remained in Iraq a few more months, constantly encouraging the soldiers, telling them they were doing good. "I was trying to give them perspective and hope," he says. "You have to build them up because they have to go back out there again." Sivret, now 52, returned to being the parish priest at St. Anne's Episcopal Church in Calais, Maine, where Guard soldiers occasionally visit. Sivret's hearing has returned and his ribs have healed, but the war remains part of his life. In December, he accompanied a master sergeant to notify a family of a soldier's death. Seeing the father's pained face, knowing the death occurred in Mosul — the city where Sivret was injured — brought back a flood of memories. "It stays with me," Sivret says. "You change. You're never the same." Chaplain Irvine Bryer faced death before, 40 years ago in another war — in Vietnam. The skinny kid who survived the jungles returned to a desert battlefield as a grandfather — and Army Reserve chaplain for the 3rd Medical Command. In Iraq, Bryer dodged mortars, rockets and shots fired at his helicopter. Still, he says, "Never did I feel there was anything to fear. There is a season for everything under the sun. That's what Ecclesiastes says. ...I take that now and have a for long time as an important part of who I am." The lieutenant colonel and Baptist minister was based at Camp Victory, the main U.S. military headquarters. He flew more than 11,000 miles in helicopters, frequently visiting hospitals, chatting and praying with the wounded, bringing calm to the chaos. One day he went to the morgue to pray for a soldier but had been given the wrong name. When a soldier there cursed him and said he should have gotten the identification right, Bryer agreed, and asked him to get the correct information. Later, the soldier apologized but still admonished him: "Get it right next time." Bryer wore a Vietnam patch on his right shoulder that didn't go unnoticed in Iraq. Once, he says, a soldier said to him: "You've done this before. You think it makes a difference?" Despite all the tragedy he saw, Bryer had joyful moments — his favorite involving a little boy. While visiting a health clinic, he says, a little Iraqi boy pointed to the chaplain's shaved head. His mother said her son wanted to touch it. "He rubbed it like it was a ball," Bryer says. The chaplain pulled a Snicker's bar from his pocket, broke it in two and gave half to the boy. "We pushed it together, toasting like we're ready to have champagne. I bit in and was making all kinds of sounds like mmmmm," Bryer says. "He was just sitting and laughing." For Bryer, now 62, this fleeting moment of friendship offers promise for the future. "I hope that when we're finished," he says, "this is what it's all about." In February, Capt. Wainwright stood in a brick chapel at Fort Hood to honor fallen soldiers. This was not a day to mourn 4,000 lost, but the eight men from his battalion who did not come home. "There's not a day that goes by that I don't think of those guys and feel some hurt in my heart," he says. Wainwright spoke in a chapel with stained glass windows that depict cavalry soldiers. The names of those who've died in other wars are engraved on plaques. Wainwright remembered each of the eight killed in Iraq by name, quoted from Psalm 20 and told mourners that these soldiers are "beckoning from the grave, demanding us to be the men they were ... good and honorable men." The chaplain wears a memory bracelet with the name of one of them, Phillip Neel, who is buried in the West Point cemetery next to the Old Cadet chapel, where Wainwright used to worship. "Every time I go back, even when I'm a decrepit old man," the chaplain says, "I'm going to go to the cemetery and look at the headstone, think and remember him, who he was, what he stood for." By Sgt. Kevin Stabinsky, 2nd BCT, 3rd Inf. Div. 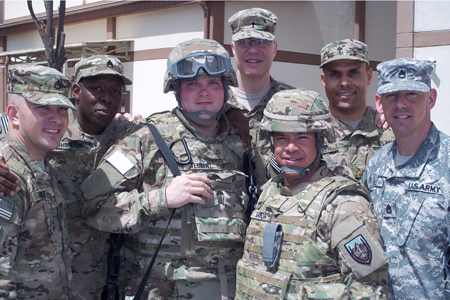 Editor's Note: Chaplain (CPT) Javon Seaborn is a CSC Chaplain safely back from Iraq. FORWARD OPERATING BASE KALSU — After serving a tour in Iraq together, married couples in the 2nd Brigade Combat Team will have certainly fulfilled the 'for worse' part of the their vows. Spc. 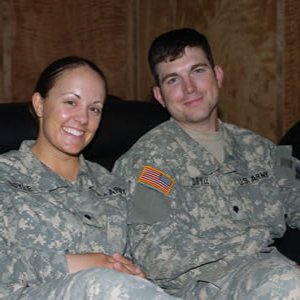 Tiffany Doyle (left), 2nd Brigade, 3rd Troop Battalion and spouse Spc. Kelly Doyle, also 2-3 BTB, relax together at the Kalsu Morale, Welfare and Recreation Center. While all Soldiers are committed to serving their nation while deployed, these couples extend that commitment to each other. Whether married for a long time, such as the Staff Sgts. Stacey and Krishni Ryland, who have been married five years, or short, like Chief Warrant Officer Jerry Emmons and Capt. 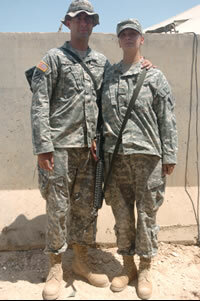 Julie Bermeister, married since October 2006, both couples said they are grateful to be deployed with their spouse. Besides the obvious advantage of seeing each other when missions allow, being deployed together has other benefits. "Communication skills have become extremely important. It is one of the things that has improved in our relationship," said Emmons, brigade aviation element officer. "We learned how to listen and talk to the other one." Even when together, such communication is vital in keeping marriage strong agreed Krishni, 26th Brigade Support Battalion dining facility non-commissioned officer in charge, and husband Stacey, 26th BSB chemical/ battalion day battle NCO. A strong spiritual relationship also helps. "We have a good relationship with the Lord; it keeps us together spiritually," Stacy said. The two also said they maintain a good support and trust system in place. "If you have those two together it (the relationship) is kind of hard to break no matter what is going on," Stacy said. That is not to say that relationships cannot undergo strain or stress while deployed. Although married couples serving together on Kalsu avoid the problem of leaving a spouse behind, additional problems in the relationship can be created. "With her being here it does add to stress; I find myself hesitant to do some things," Emmons said. Burmeister called the situation a double edged sword. On one hand, she said it is good that as soon as he comes back from a mission, she can see that he is okay, yet each time she sees him drive or fly off, it hurts. The Rylands agreed, saying that it is stressful when they do not have accountability of each another. Expressing feelings for each another can also be a challenge, said Chaplain (Capt.) Javon Seaborn, 26th BSB chaplain. "The reality is that deployed married couples share a different dynamic that single Soldiers or married Soldiers whose spouse is not in the military can't relate to. Deployed married couples see each other every day but cannot express their feelings to each other because of the deployed environment," Seaborn said. Although the brigade is attempting to secure lodging to allow couples to live together, currently couples are separated. Work schedules can also interfere with time spent together. Originally the Rylands were on different schedules; Krishni worked day and Stacey worked nights. Before Stacey switched to day shift these conditions interfered with the couple's ability to spend time together. Emmons said he and his spouse spend time talking with the chaplain to help with difficulties. Although his main function is to support the religious needs of Soldiers, Seaborn said another big chunk of his workload deals with helping married couples overcome difficulties experienced during deployment. "Almost all of the couples that I have seen have had the same issues with communication and how this environment tends to restrict them as a couple," he said. To help these couples, Seaborn said he suggests couples take time to Ôdate' each other again. A good date is sharing meals in the dining facility. Besides seeing each other, dinner dates at the dining facility give couples a time when they can come together. They could catch up on what is going on at home and vent to each other about the day or the week, Seaborn said. Merging the military lifestyle with their marriage lifestyle can also help. Emmons and Burmeister like to go to church and walk to work together while the Rylands said they run and do physical fitness training together. Seaborn also suggested doing little things like writing love letters, leaving notes, or surprising them with a gift and putting it on their cot or in their sleep area will pay big dividends. To further help couples, Seaborn said he and brigade chaplain, Chap. (Maj.) Jay Hearn, are planning classes for married couples to attend to strengthen bonds. Retreats for freedom rest are also being planned. All of these things are being offered to help couples remain strong through their deployment struggles. Despite some of the struggles, all the couples said they would not trade it for anything. "I prefer him being here," Burmeister said. "Being able to see each other; I like having that support," said Krishni, whose first deployment to Iraq was spent away from her spouse. "You can always talk to your spouse." Pfc. Jason and Pfc. Jacqui Spillane are one of eight dual-miltary couples serving together at Forward Operating Base Kalsu in the 26th Brigade Support Battallion. The battalion contains 18 dual-military couples. Sgt. 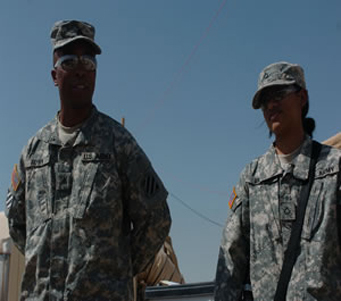 Kareem Brown (left), Headquarters and Headquarters Company, and his spouse Pfc. Diana, 2 Brigade, 3rd Troop Battalion, are one example of couples serving together at Forward Operating Base Kalsu. Forward Operating Bases (FOB) Freedom and Liberty have prioritized scheduling and logistics to support mobilizing Soldiers' religious commitment. 1st Lt. Bryan T. Wright, 478th Engineer Battalion (left), and Maj. Quentin Collins, 1203rd Engineer Battalion (right) baptize Staff Sgt. Edward A. Lewis, 224th Engineer Company, in a handmade, field baptismal font at Forward Operating Base Liberty. "Freedom of religion; if you honor that, you honor everything the Soldiers stand for," said Chap. (1st Lt.) Bryan T. Wright, with the 478th Engineer Battalion. "Take that away, and you take away everything a Soldier stands for and puts their life on the line for." "We're here to provide support for all denominations," said Chap. (Maj.) Quentin Collins, with the 1203rd Engineer Battalion. "We're here to provide support for the freedom of religion." A small crowd, including a unit commander, gathered around a plastic-lined wooden box filled with water located a few yards away from the motor pool, a dusty road and large tent under construction. Their purpose was to show support for Pfc. 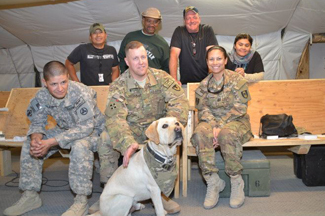 Conner L. Green with the 1203rd and Staff Sgt. Edward A. Lewis with the 224th Engineer Company, who chose to participate in a field baptism as a testament to their beliefs. "It was something I always wanted to get done before I went overseas, and my whole squad turned out for it," said Lewis in response to his field baptism. Inside a triple-wide trailer, where the walls are covered in improvised explosive device-defeat posters, road maps of Iraq, sand tables and charts, groups of Soldiers meet weekly to express their faith and set aside time for worship during their mobilization training. "The FOB got behind us and dedicated one classroom to us all day long, so whenever we could coordinate schedules it was available and ideal," said Chap. (Lt. Col.) Gary D. Gilmore, with the 35th Engineer Brigade, who held services at FOB Freedom. "We had services morning, noon and night with a good mixture, variety and response of all units, at all three services." Father Patrick Boyle, a contracted Catholic priest, reads a passage and blessing at Forward Operating Base Liberty. "The Army and the government have an obligation to support a Soldier's right to the free exercise of religion," said Chap. 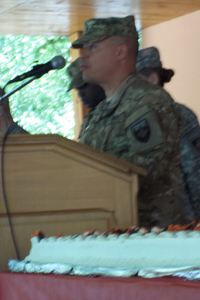 (Col.) Steven Colwell, the Fort McCoy installation chaplain. "Chaplains, chaplain assistants and other religious support personnel are the way the government attempts to fulfill that obligation to the Soldier's First Amendment rights." Catholic Masses at the FOBs started in July and are held Sundays at Liberty at 11 a.m. and 12:30 p.m. at Freedom. Father Patrick Boyle, one of the Catholic priests contracted to provide services, travels from Mundelein, Ill., to officiate some of the services. He served as a chaplain in Vietnam and offers the same format of Mass that he performs for his home parish. The Mass includes communion and crowd interaction; Spc. Jacob C. Steele, 2nd Lt. Matthew J. Kremer and Spc. Justin Case with the 478th Engineer Battalion all read passages for the congregation during the second service offered at Liberty this summer. He tells Soldiers, "Even if you can't get to Mass, keep it in your heart. Pray for everything; pray for the war. Do your part, take no chances and be careful." Protestant Services are scheduled at both FOBs at 7 p.m. Sundays. 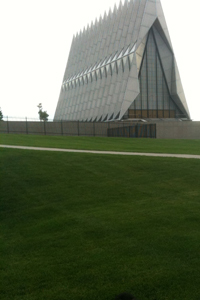 Unit chaplains stationed at the FOBs may offer more flexible chapel schedules. 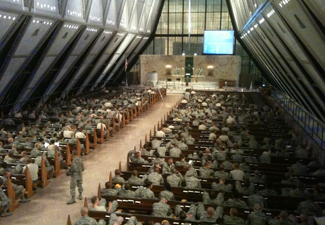 Due to training schedules, chapel attendance has ranged from eight attendees to 120 Soldiers. "Soldiers have been frustrated when they can't get there," said Gilmore. "It's hard to make time when the training schedule treats Sunday like every other day and there are no two hours where everyone stands down." "We're all here training to go to war but if we are not spiritually ready to go then all that training will not be effective," said Collins. Collins brings in a personal MP3 sound system, a laptop and a PDA to provide worship service music, slides and sermon notes. "Encouraging, uplifting messages of hope," he said are his main focus. "Joy is the key thing; joy breaks tension in intense situations." But according to these chaplains, chapel services are only a small part of the mission. Chaplain's assistant Sgt. Joel Taylor with the 1203rd explained that the main focus is to go out and minister in the field and to give spiritual encouragement to the Soldiers. "Most of the ministering is out with the troops in the field, 11 at night up in the guard tower, praying with them before they go outside of the wire; that's where it's at," said Wright. "Soldiers are good readers of who's genuine and if you really care about them." "Preaching is a small facet, less than 10 percent of the emphasis," said Collins. "It's a proactive mission; we're called to be with the Soldiers, as a good luck charm, a talisman. Commanders value what religion brings to the fight." "It's a different worship atmosphere when Soldiers come together," said Gilmore. "It's a boost for morale, a positive impact for the head and heart; then get out there and train." For more information, contact the Fort McCoy Religious Support Office at (608) 388-3528 or visit the Chapel Center in building 2675.